Hello! We have so much wonderful inspiration to share with you here on the blog today! I really wanted to go and play with a Visible Image Monolith again, as it has been so long. Curious on how you can get plastic wings to stand up without any support? I show you in my video ^.^ Enjoy! Loving those warm sepia tones and the texture is gorgeous! We will be back later with a gorgeous card from Jane Tyrrell, and the very first DT project from Heather Mitchell. 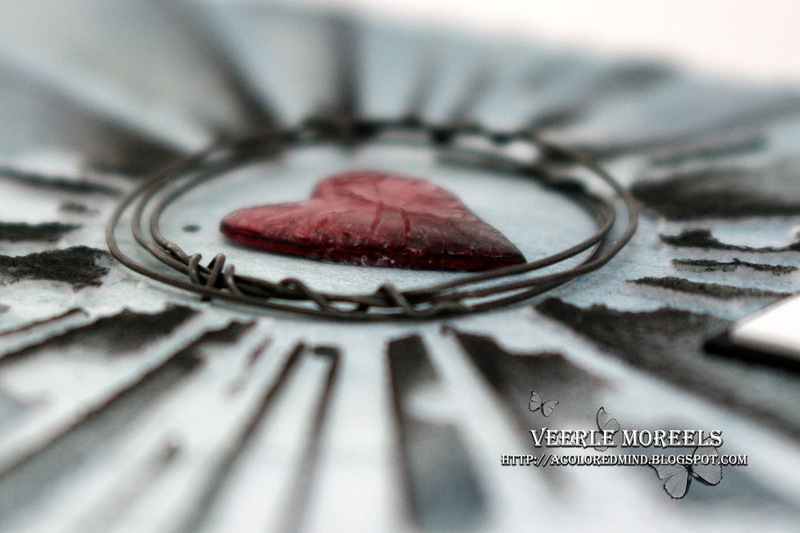 Stunning tag Veerle ♡ And a fabulous video too, thank you! 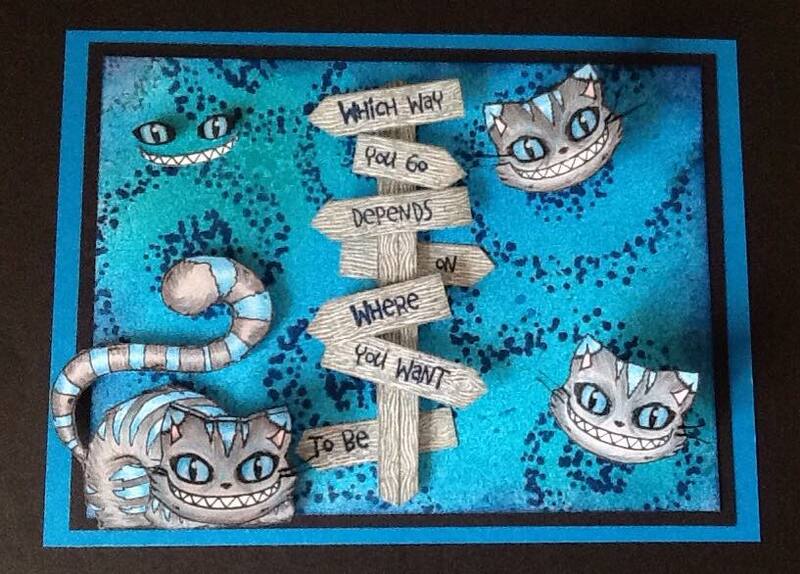 We will be back with an awesome card from Jane Tyrrell tomorrow. Hi there! Wow summer is well and truly here.. we don’t often have such high temperatures here in Wales but it’s been scorching the last few days! We actually took some ‘time out’ over the weekend which made a nice change. The original text was to big to put on the front but leaving the ‘now’ off still gives you a beautiful reminder. We will be back soon with more fantastic inspiration! Hello! We are back with more gorgeous inspiration as promised.. show much to share with you today! 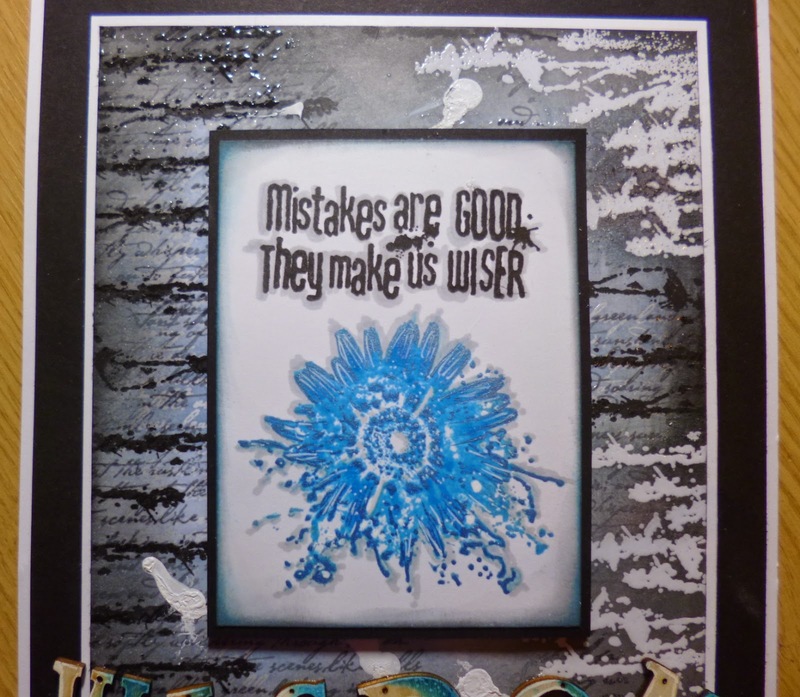 Dare To Swim is one of the new stamp releases from Visible Image. Blue Bottles are the jellyfish in our region that we often see washed up on the beach… painful too if you go swimming when they are about! They are only tiny, but they pack a fair punch. This set has everything! 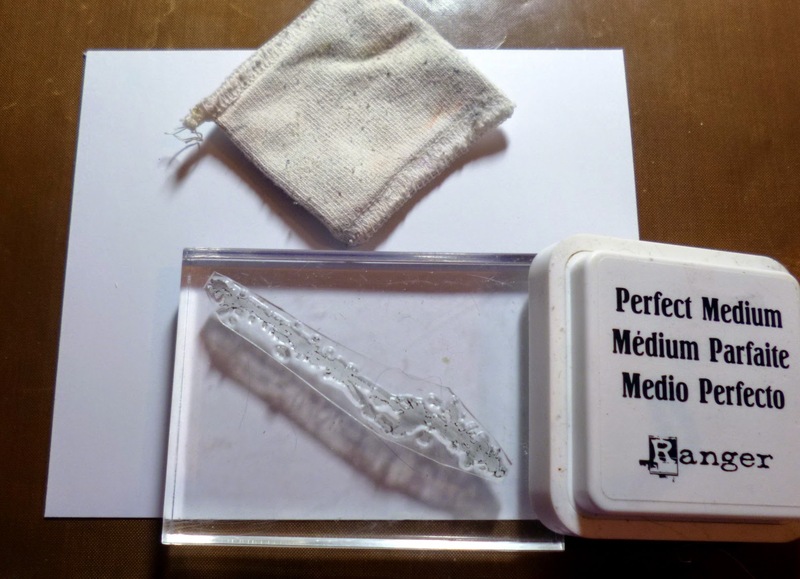 From jellyfish, to weed, to fish, to bubbles – along with a sentiment. 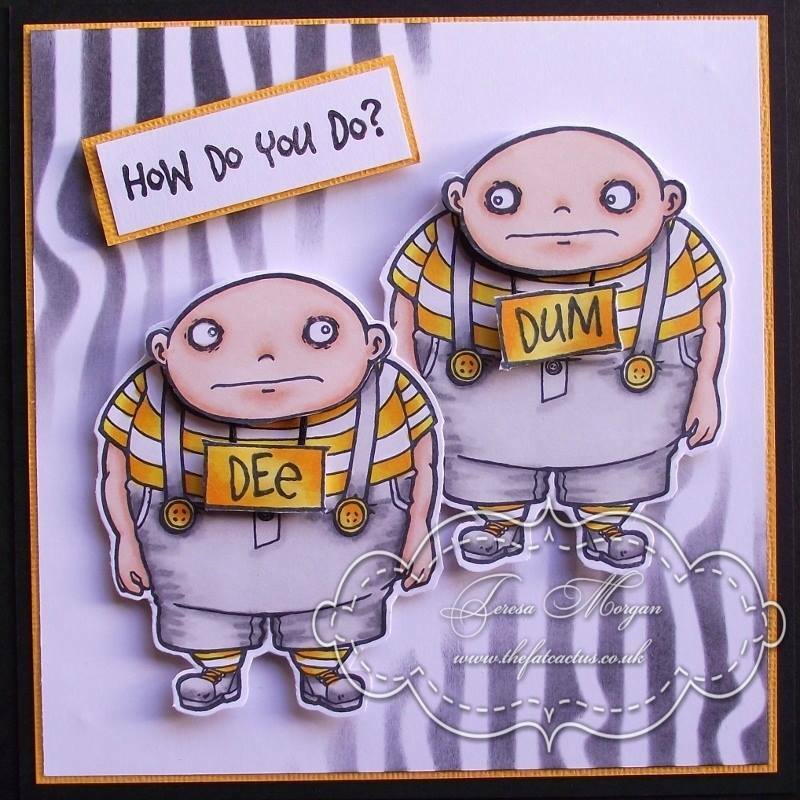 For this card my distress crayons were used for the background. It gives a lovely muted look and reminds me of what it looks like underwater. 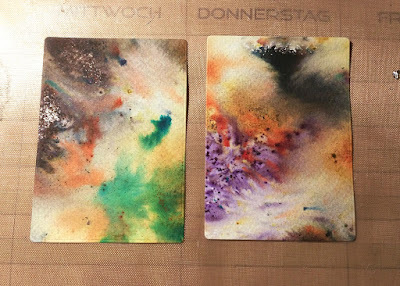 The drips are done with the crayons too – so versatile! This is such a gorgeous scene Dot.. beautiful background ♡ Thank you! Hi there! We promised you more awesome inspiration so here we are delivering! I have never considered myself to be a ‘girly’ girl, but I fell in love with the Born To Perform stamp set when I first saw it. I die cut a large tag from black card using my Sizzix Alterations die, then stamped the word ‘Dance’ onto strips of white card using Distress Inks. Once these were trimmed to size I glued them in place then stamped and embossed the ballerina over the top. Some rainbow ribbon completes the project. 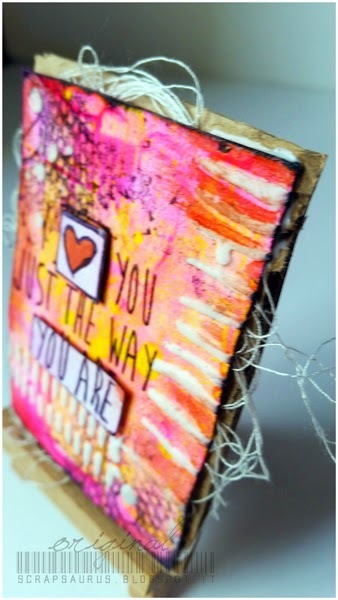 You will find more of Teresa’s inspiring cards and projects over on her blog. We will be back tomorrow with some Face it! inspiration from Pauline. Hello! 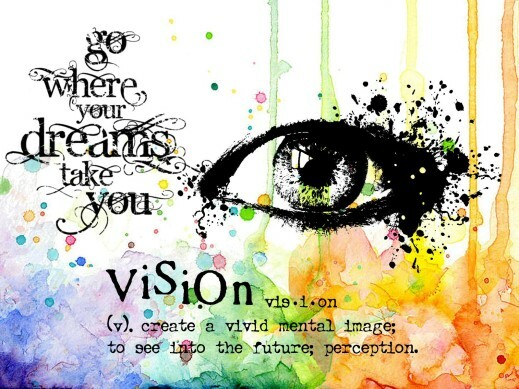 Thank you for visiting us here on the Visible Image blog today! I was so excited when some of them popped through my letter box, and I’ve had so much fun creating with them too! They are all available to pre-order now! So……. 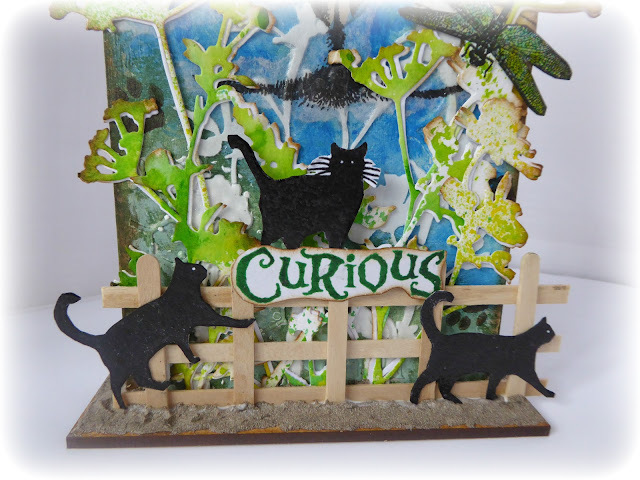 today I am going to share a card made using the awesome Curious Cats set. with Versamark, added the Wow Black Glint Embossing Powder, and heat set it. 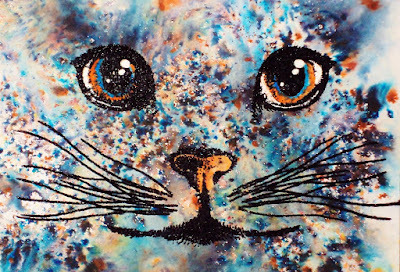 to get the Purr bit, and heat embossed using White Embossing Powder. 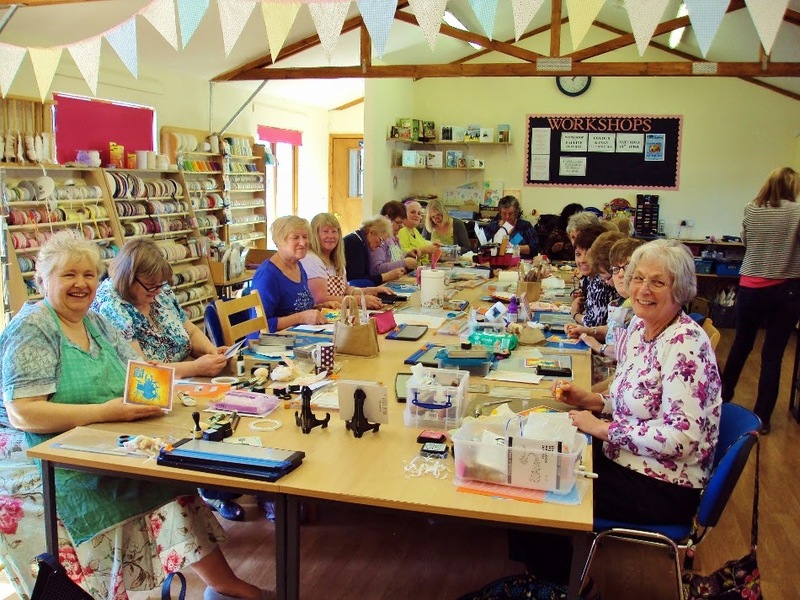 You will find more of Pauline’s gorgeous projects over on her blog. 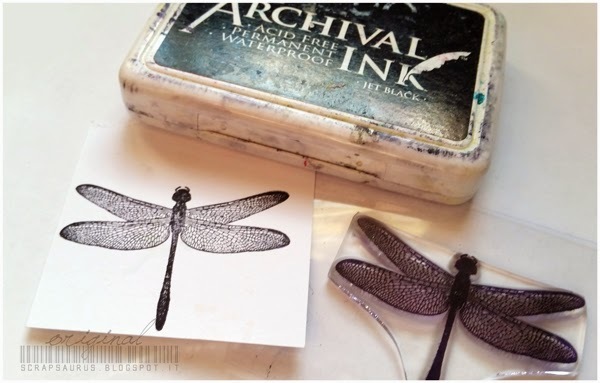 as we have more awesome NEW stamps inspiration to share with you! Hi there! Thank you for stopping by today! 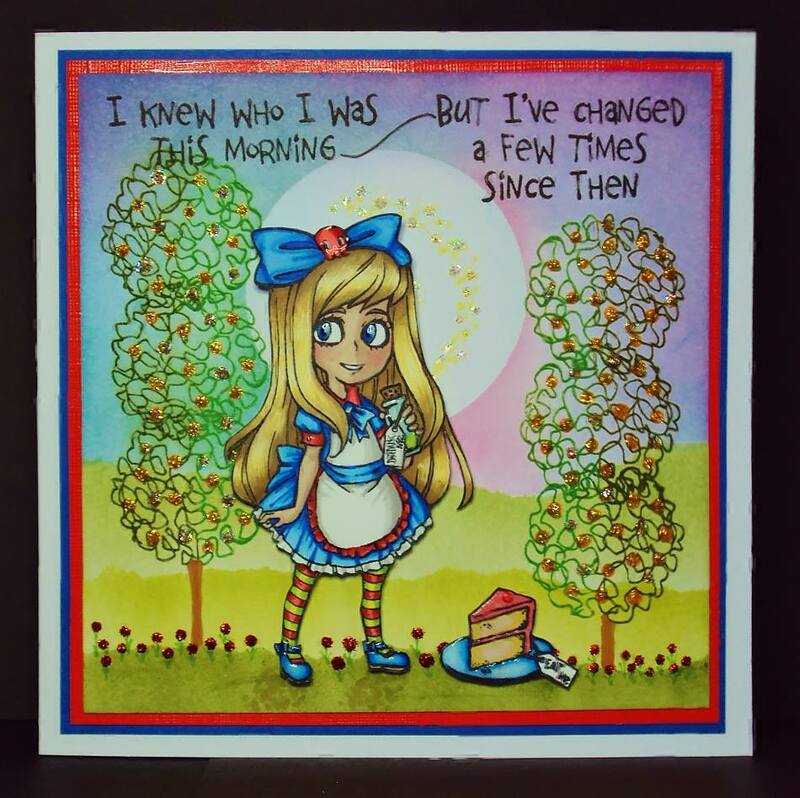 We are really excited to be sharing preview #9 from our February NEW stamps release a little later! 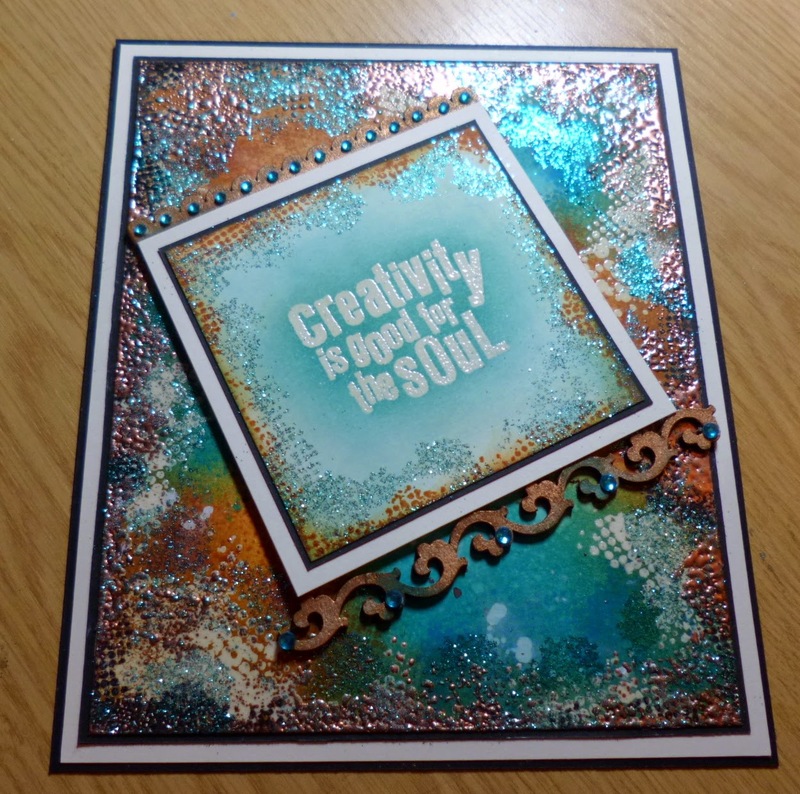 It’s Fabulous Friday, and I’m here to share a creation I’ve made, using some fantastic Visible Image Stamps. 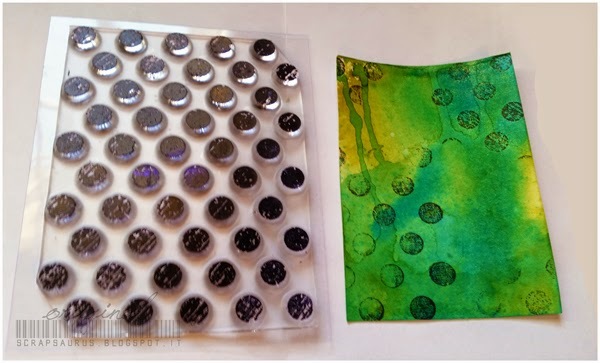 I started with some white Water colour card, and sprinkled various colours of Brusho’s randomly on to it, then spritzed with water ( the more water you add, the more the colours will run into each other, and the paler they become). I dried it with my heat tool, (Brusho’s become permanent when dry) I then repeated the application. When it was dry, I stamped the two figures in the foreground, using Versamark, and heat embossed them using Black Glint Embossing powder. I then made masks out of a couple of post-it notes, and covered the figures, so’s I could stamp the Drummer behind them, he was heat embossed using Black powder. 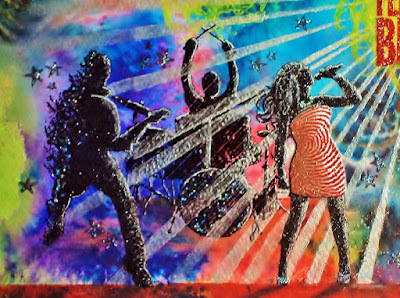 Whilst the masks were still in place, I put a stencil on top, and added some Diamond Sparkle Medium through it, using a palette knife, this looks like laser lights on the stage. Using some silver paint and a white pen, I added all the highlights to the ‘Band’, to give them some perspective. 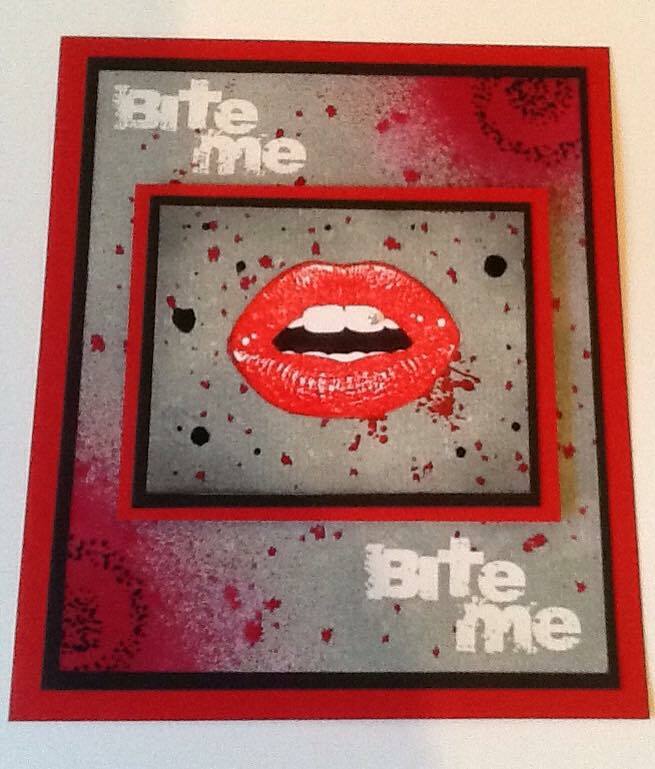 The sentiment was added using Versamark and some Red Glitter Embossing Powder. To finish off, I ‘grounded’ the Band, using some red Distress Ink, stamped some little stars in Black Versafine, and then added Stardust Stickles wherever I fancied !!! The stamps I used are..
Wowza! Incredible scene you have created there Pauline! 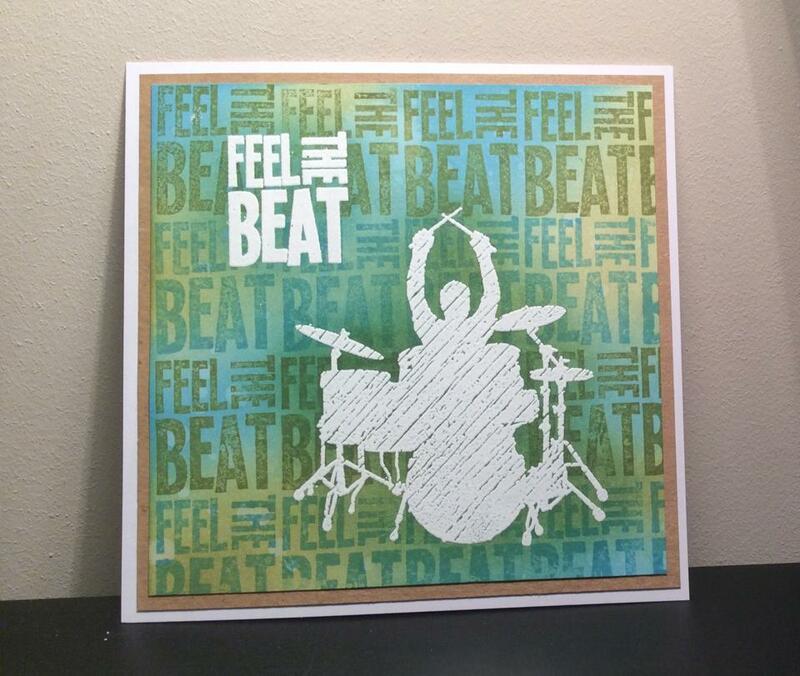 You can feel the beat just by looking at it! So atmospheric! 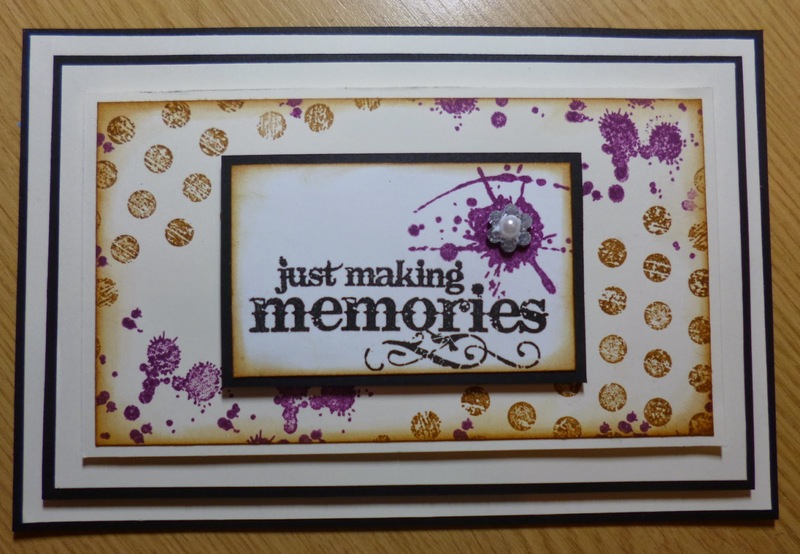 You will find more of Pauline’s fabulous cards and projects over on her blog, including the results of a recent workshop she held using our MDF Monoliths! 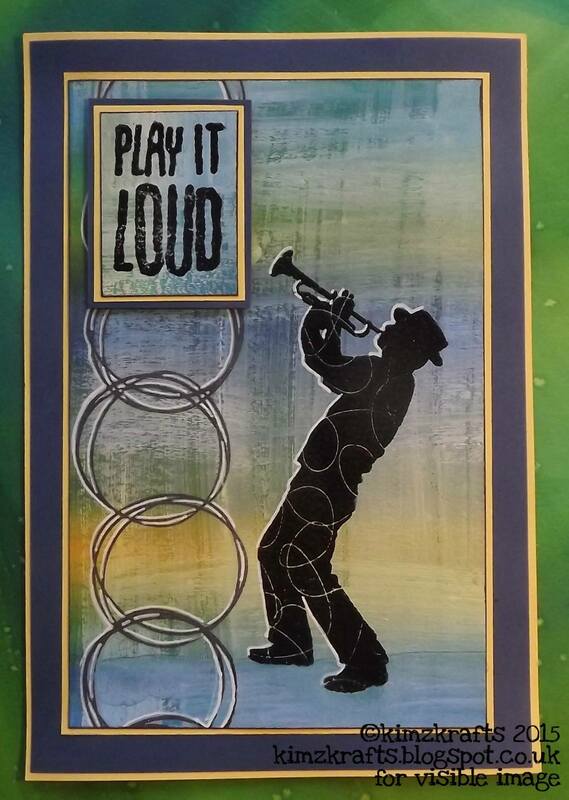 We hope you are feeling inspired to get out your stamps and have a play! We hope you will pop back later to see preview #9…. something really different! Good morning! Or maybe it’s afternoon or evening where you are! Thank you so much for visiting our blog today. 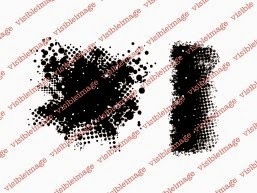 Welcome back to today’s Thrilling Thursday post for Visible Image stamps. 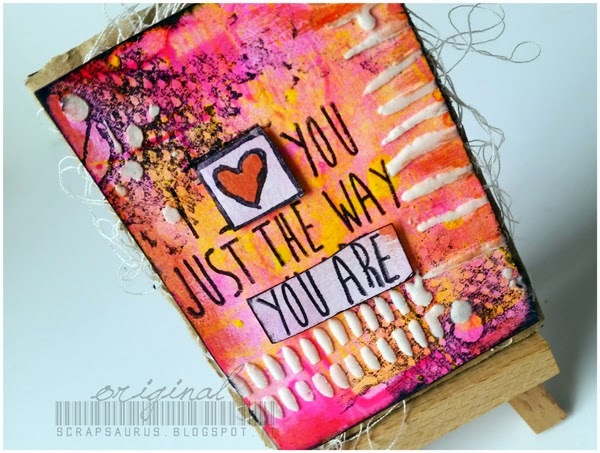 Today I am sharing the project I created for the January issue of Craft Stamper magazine – a gorgeous canvas! 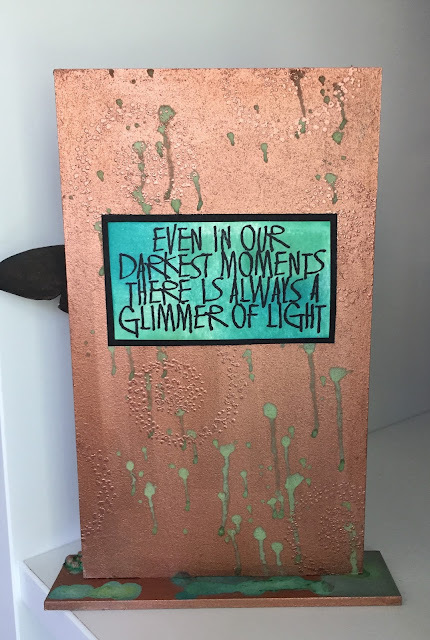 I used a 12 inch square black canvas – if you can’t get a black one, then just paint a white one with black gesso or acrylic paint and allow to dry.I stamped the ripples in a diagonal design across the canvas using Versamark ink so I could emboss with metallic embossing powders. 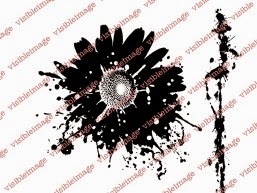 Don’t worry if your stamped images aren’t perfect – canvas is textured and can be tricky to get a clean image. A lot will be covered once the canvas is finished. I took some black card and stamped and embossed several sets of ripples before cutting the different rings apart with a sharp craft knife. 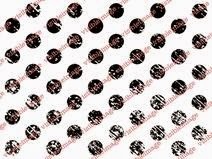 These are attached with Pinflair glue gel to create a dimensional effect. Finally I stamped and embossed the sentiment on black card, cut apart and attached with glue gel before setting aside to dry. 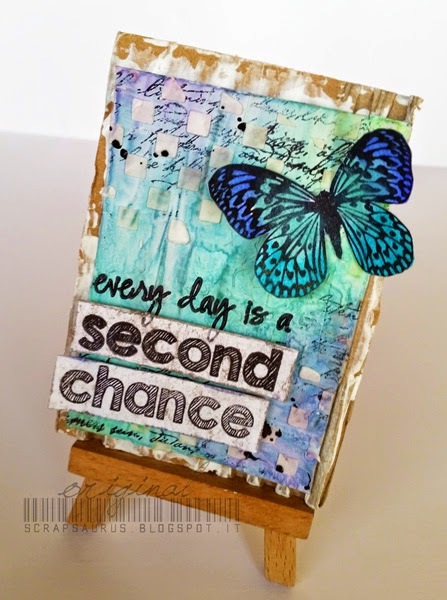 We absolutely love how Teresa used our Ripple Effect stamp! 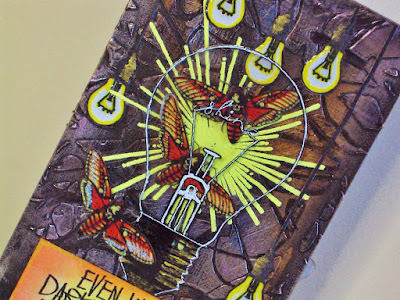 You can find more of Teresa’s awesome cards and projects over on her blog. Are you intrigued to see our first NEW release of 2017.. well the wait is almost over! We will be starting to preview our new stamps this evening! So pop back here later or come on over to our Facebook group to join in with the excitement! All our social Media links..
Hello 🙂 Thanks for visiting our blog! An ATC is a card that measures 2.5″ by 3.5″. I cut two from a Brusho background. 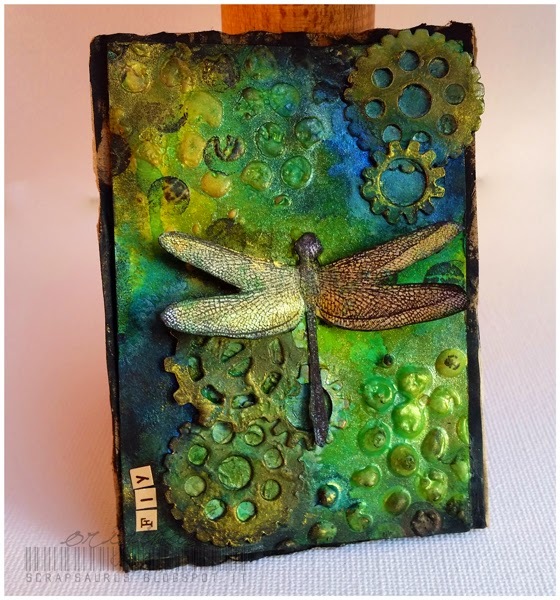 I used my square mini Gelli Plate to add some texture. I used the mini Honeycomb Delight stencil by STAMPlorations plus “Wedding Cake” paint from Martha Stewart. 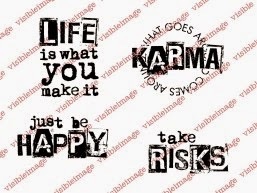 I stamped the sentiment, which comes with the Visible Image stamp set, randomly on top. Just to create more texture. 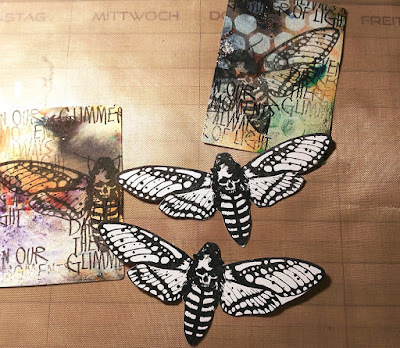 Í stamped the main image – the death’s-head hawkmoth – on my cards and also onto some white cardstock. 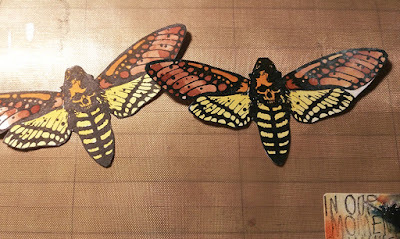 I used Distress Inks to color the moths. 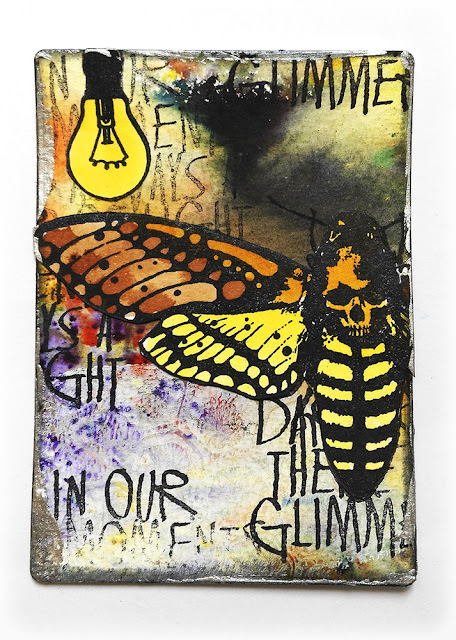 I adhered the butterflies after I stamped the light. I stamped the light on white cardstock and adhered it, too. I inked the edges with Distress Ink “Black Soot”. 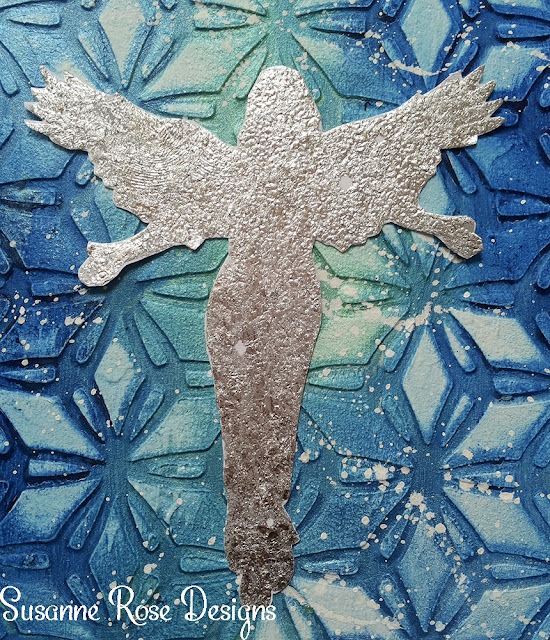 For a special finish, I used some silver embossing paste and scribbled it all arround the edges. See you soon with more gorgeous inspiration! 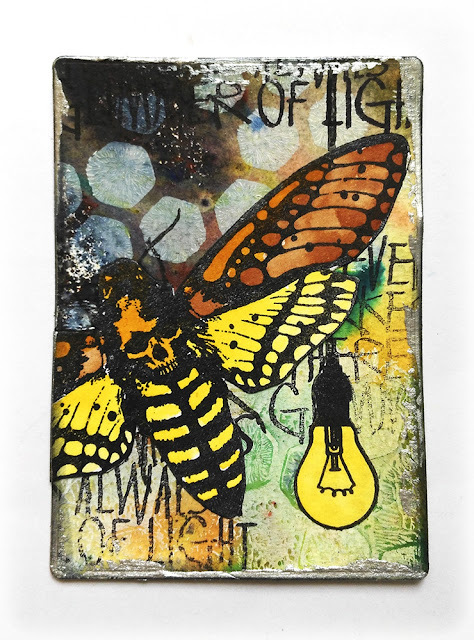 Great for art journaling and mixed media projects! 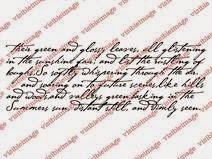 And how awesome is that font! Pauline will be here with her fabulous Friday post too! 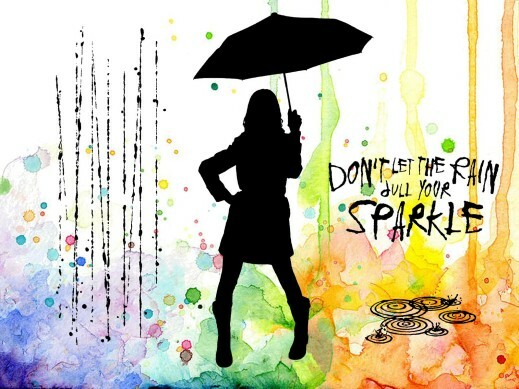 The image is super cool, and can be used for all kinds of projects, and the words are so apt for our UK weather! 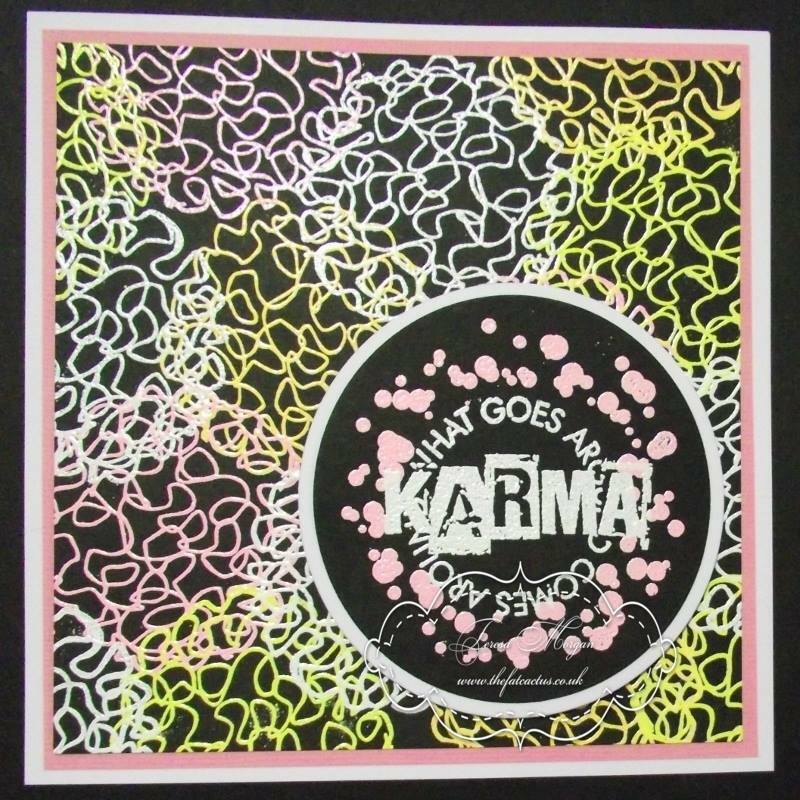 We will be back later with Corrie Herriman’s Design Team debut! 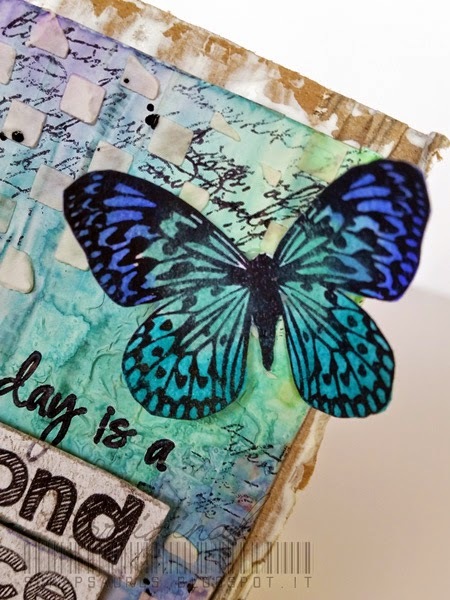 Do you love stamping and creating mixed media projects? Do you enjoy inspiring others? And most importantly.. Do you LOVE our stamps? If the answer is YES then you might be interested in joining our team! We are incredibly passionate about what we do! And we’re extremely proud of our unique designs and the superb quality of our stamps. 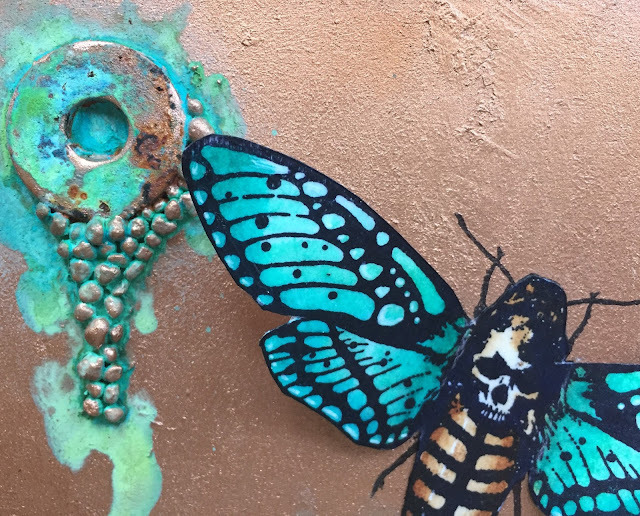 If you love making mixed media pieces, then you might just be who were are looking for! We also have a Facebook PAGE and a fabulous customer group on Facebook too! Positions will start in January 2016, working with our brand new stamps prior to release! Passionate about stamping. Proud to be different. Hello 🙂 Thank you for visiting our blog today! Well we are back! And to celebrate we wanted to do something nice for all our wonderful customers. There is a brilliant selection to choose from so there are bound to be some from your ‘I WANT’ list!!! *Stocks are limited however at these prices so check out our sale at your earliest convenience to ensure you don’t miss out on your favourites! 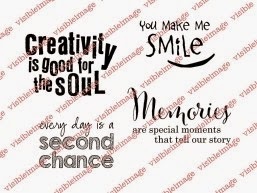 Whether you are into card making, scrapbooking, mixed media, or if colouring is your thing.. you will find awesome stamps you’ll love at amazing prices! So head over to our website shop and find our 30% OFF SALE HERE! From midnight Wednesday August 25th until Sunday August 30th or as long as stocks last! 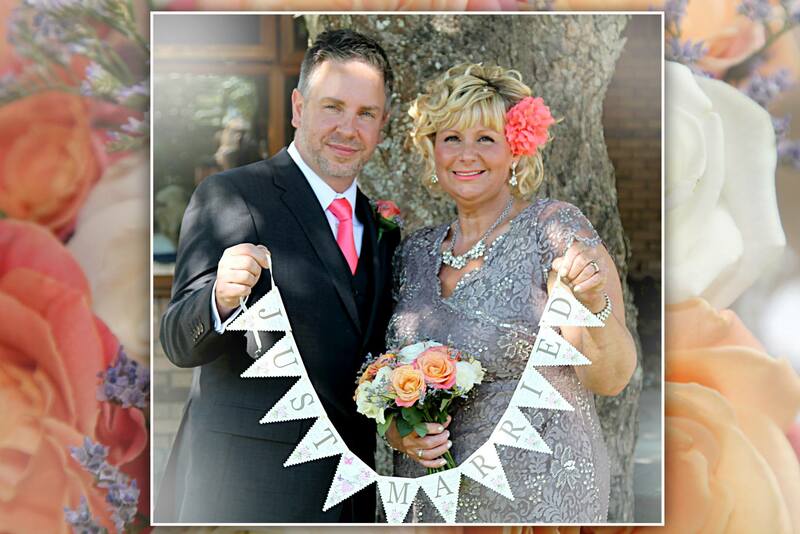 We also want to say another massive THANK YOU to everyone who took the time to send us emails, messages, cards and wonderful wishes for our special day. It really meant the world to us! Check out our EVENTS PAGE too for all our upcoming show dates! 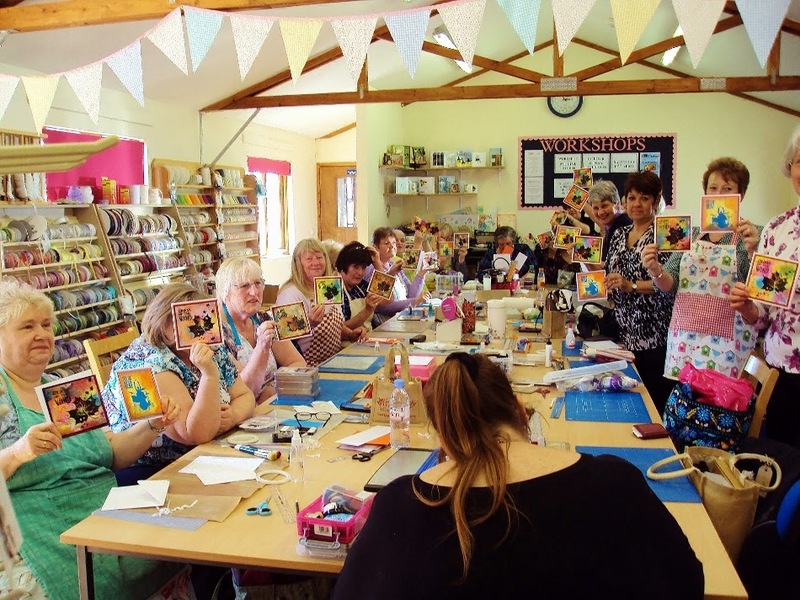 We will be at Ally Pally on September 19th & 20th and our fabulous Kim Robertson will be demonstrating and holding Make & Take sessions on our stand! We also have 12 pairs of fast pass tickets to give away.. so head over to our Facebook PAGE for your chance to win some! We will be back tomorrow with a massive catch up of all the gorgeous cards and projects our amazing Design Team have been creating while we were away! 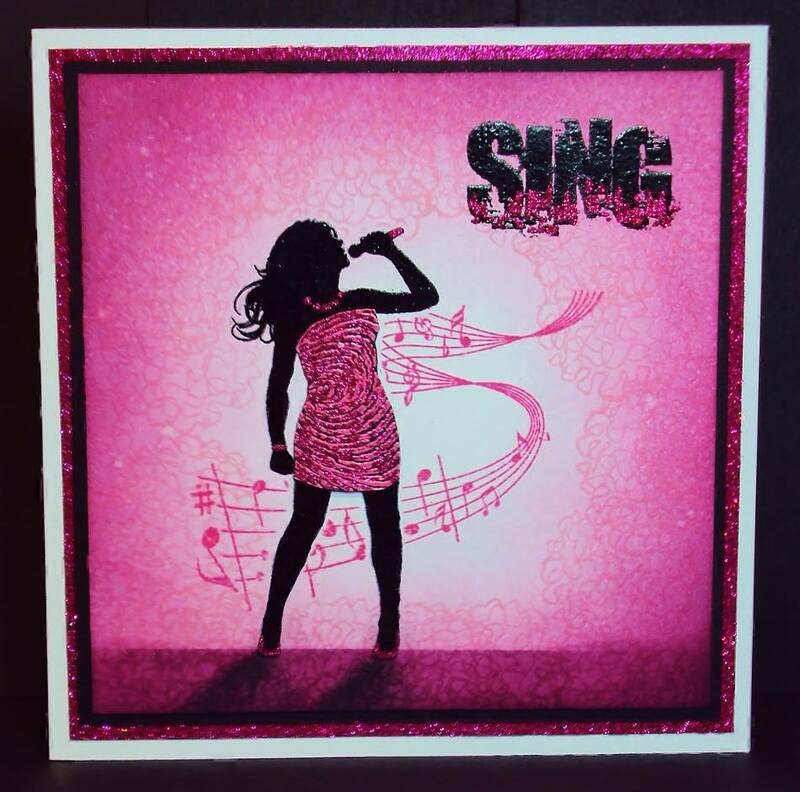 All these amazing cards and projects were of course created with Visible Image stamps… you will find our shop HERE! If you click on the DT names it will take you over to their blogs for more details of how they were created and which stamps they used. We will be back to work on Monday August 24th.. so if you want some gorgeous new stamps to create with, you won’t be waiting too long now! 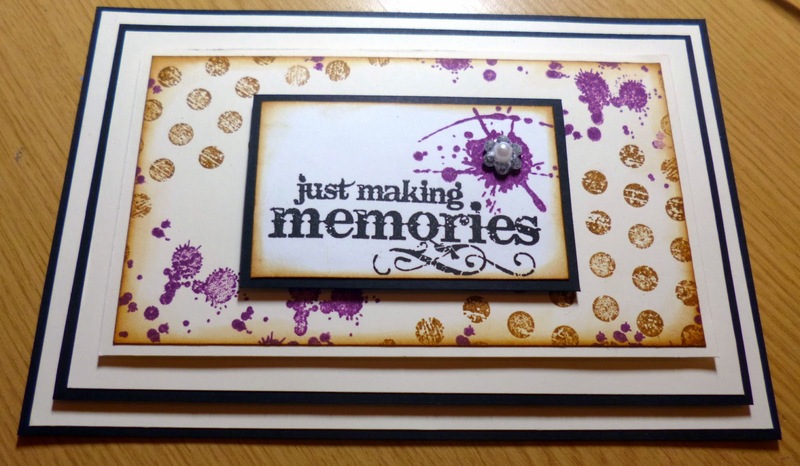 Come and join our Facebook group… Upload photos of what you have made with our stamps for a chance to WIN some more in our ‘Show & Tell’ challenge! If instagram, pinterest or twitter are more your thing… you will find us there too! We will be sharing some photos from our very special day here on the blog a little later. Have a great day 🙂 And thank you for visiting our blog today… we hope you have been inspired. Another Monday has arrived! Hopefully you all had a good weekend? 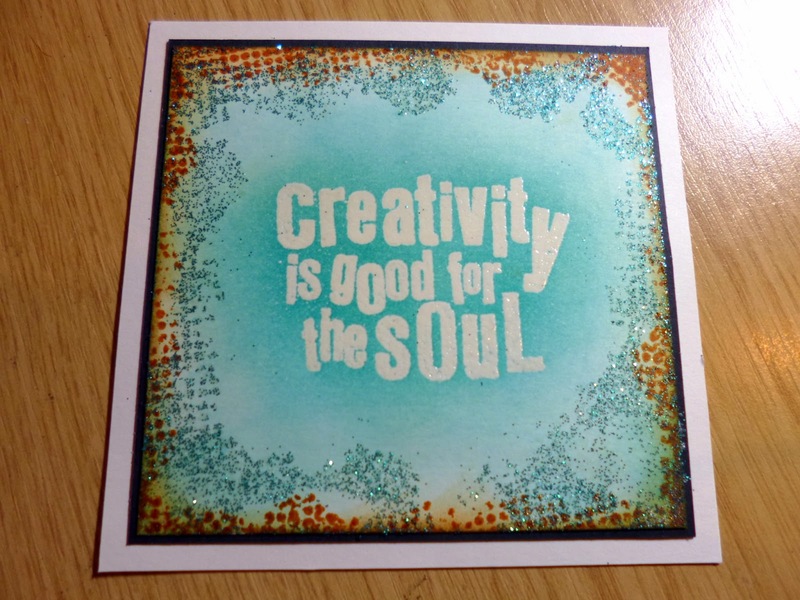 Today I am featuring a card I made using one of the totally awesome Visible Image stamps along with a piece of paper that very nearly went in the bin! You know I love making backgrounds? Well, I cover my desk with a piece of cheap paper before starting any painting and spraying so I don’t get the cutting mat dirty. I have a huge mat and am just too lazy to move it off the desk. 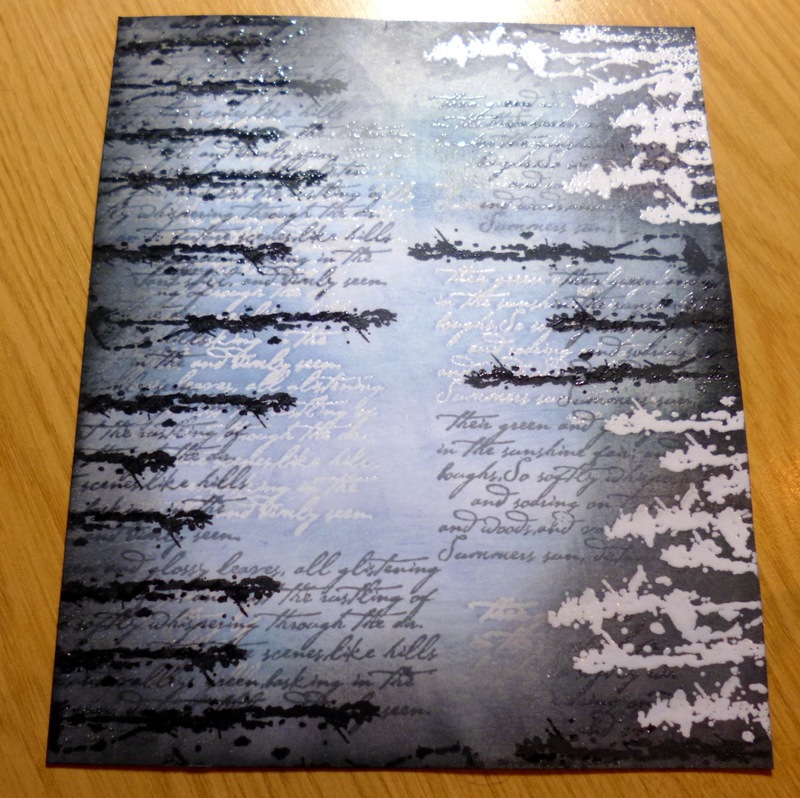 The card I made with a piece of this paper features the lovely flying bird and tree silhouette.. I stamped the image using a Tim Holtz distress embossing powder hence the grainy look. I covered a piece of card with the image because the paper is quite thin. 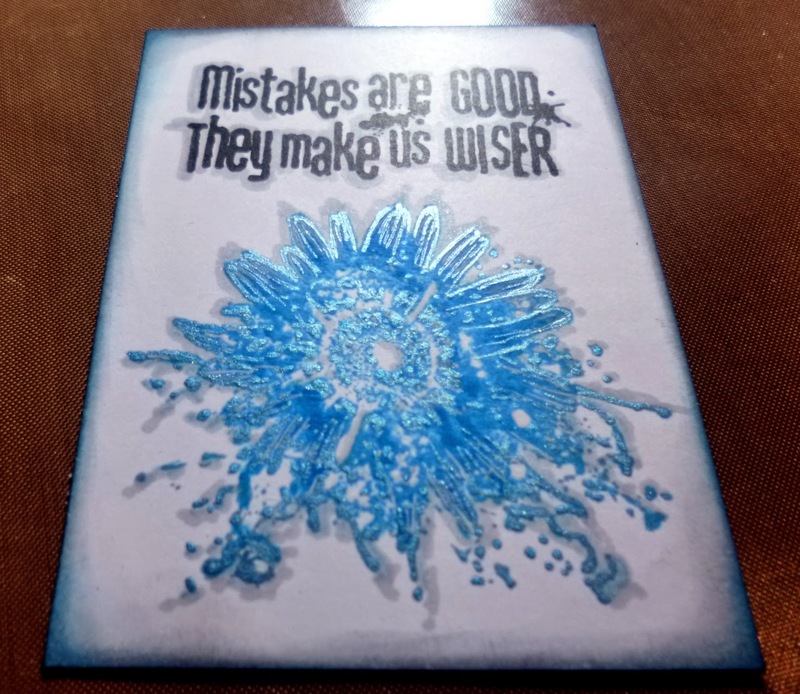 I didn’t leave enough space for the sentiment so I stamped it onto a piece of heat resist acetate which I secured with some eyelets and beads at one side. The curve helped fit the sentiment on! We will be back tomorrow for Soozie Tuesday with Sue Joseph! Good Afternoon! Hope you are having a fantastic weekend! 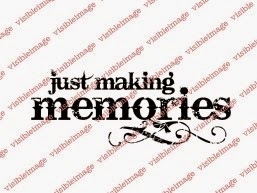 This will be my last Visible Image Stamps blog for a couple of weeks, as I’m off to the seaside for a well earned rest, lol !!!! 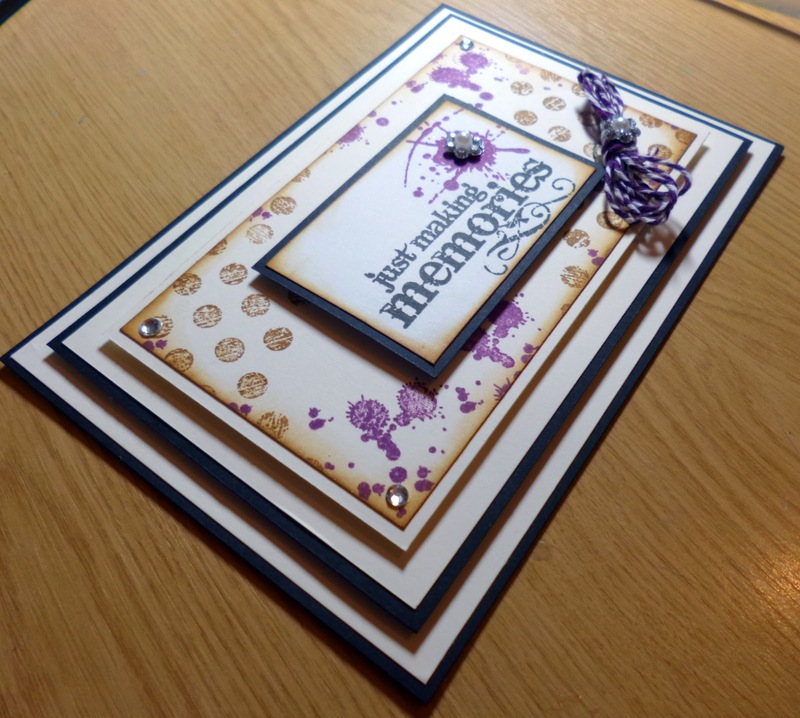 This is the card I made her, using her favourite stamps and colours (I hope)….. The stamps I used were……. Flower Inkognito and Happy Birthday Set. 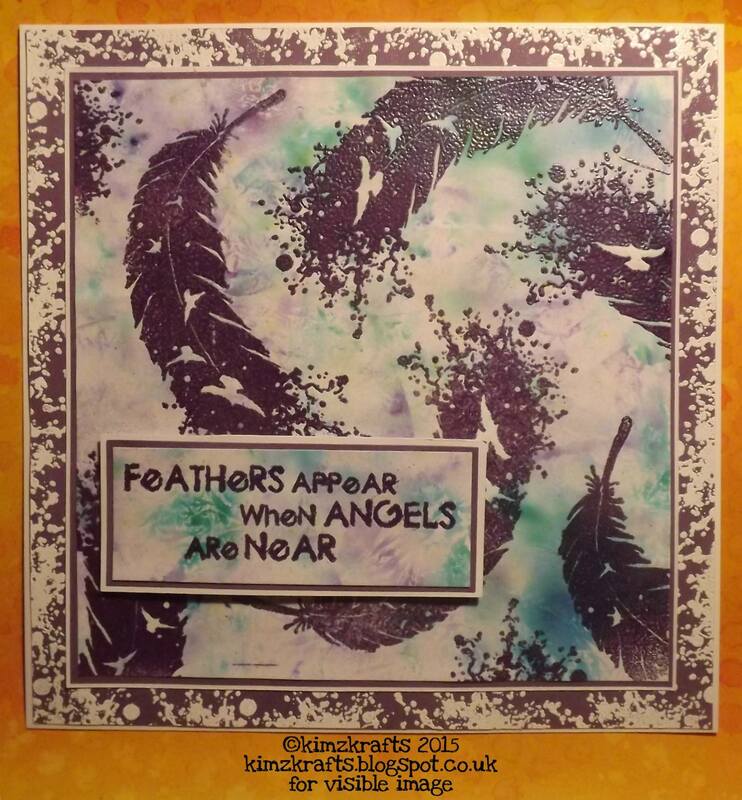 I created the background using shaving foam and Dylusion sprays, I heat embossed the Flower Inkognito using black powder, and then painted them with purple Stickles, I used the flower from the Happy Birthday set around the edges, and heat embossed the sentiment to match. 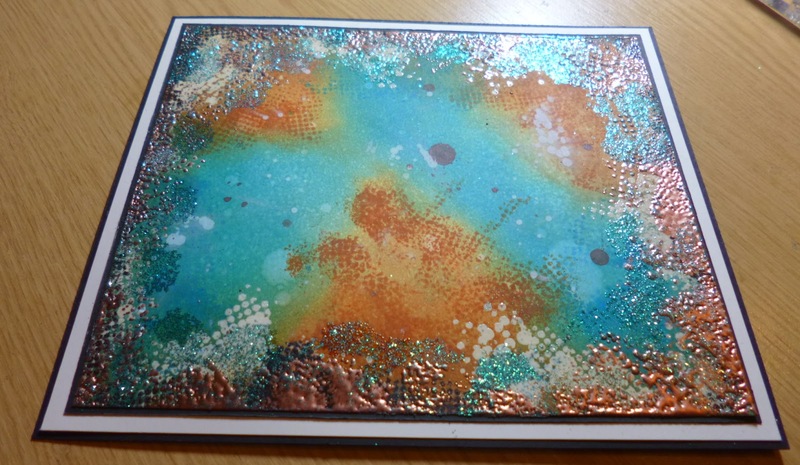 My second card is a little ‘Thank you’ card…. 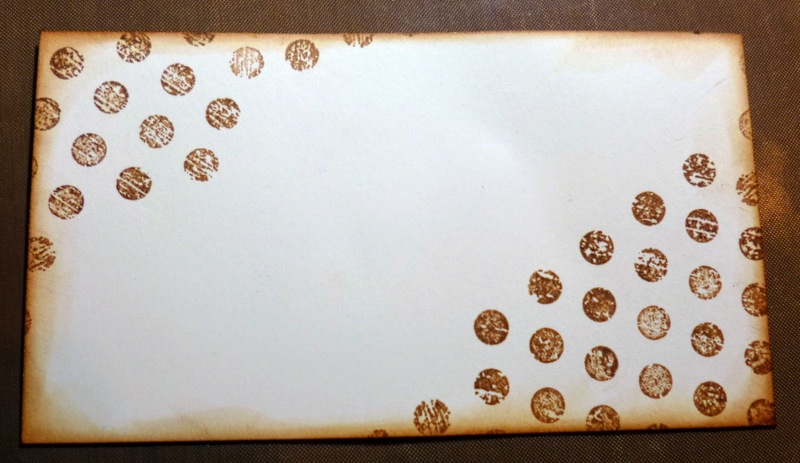 The stamps I used here are….. 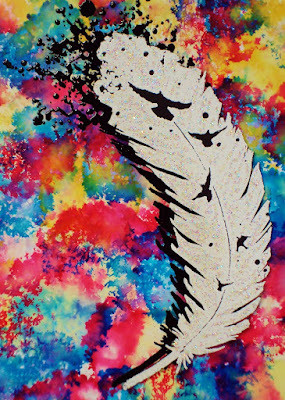 The feather from Angels are Near and the sentiment from the ‘Thank you Set’. 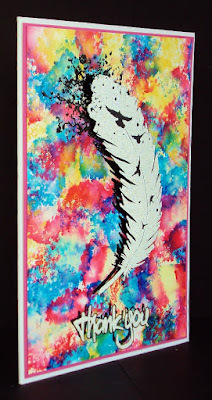 The background is Alcohol Inks on a Glossy Card, the feather was first stamped in Black Stazon ink, along with the sentiment. 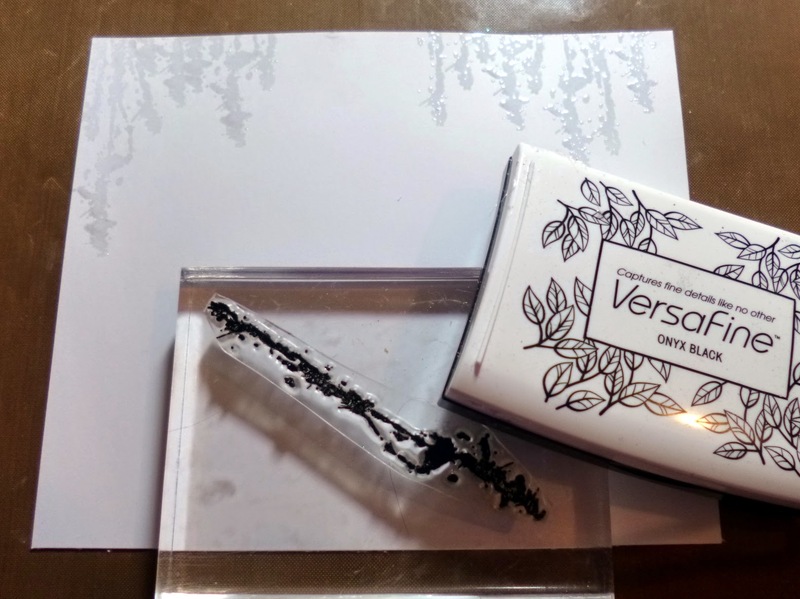 I then stamped the feather using Versamark onto some black card, and heat embossed in White powder. 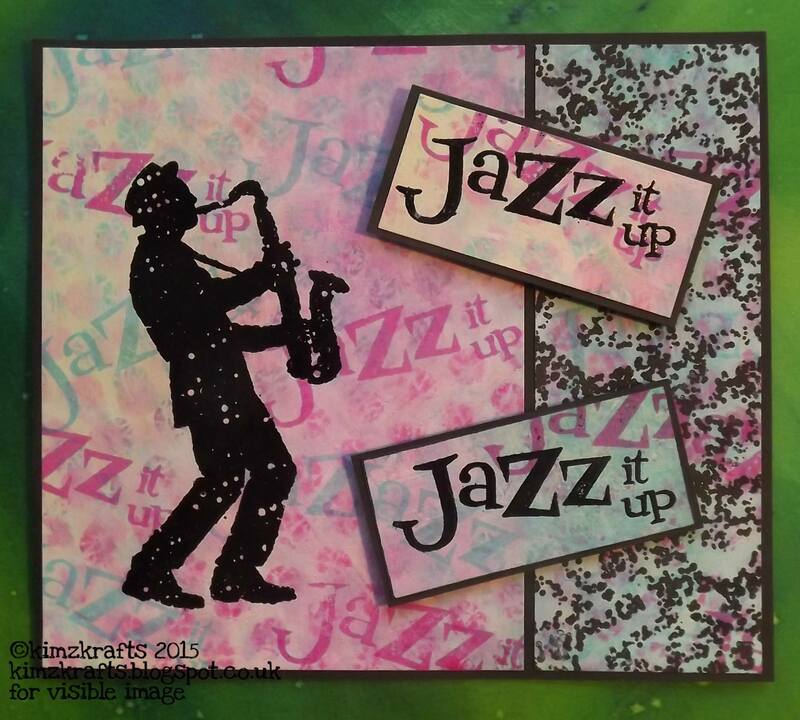 I fussy cut this out, shaped it and using Gel Glue, added it to the background but offset it a little to give the illusion of a shadow, I put some Stickkles on the top for sparkle. A few days left to enter the Visible Image ‘Show and Tell’, for a chance to win some new stamps, all the details are HERE. Check out the Visible Image Facebook Group, with lots going on HERE. Thank you for visiting, and I shall be back a little browner, if English weather permits, and a lot rested. 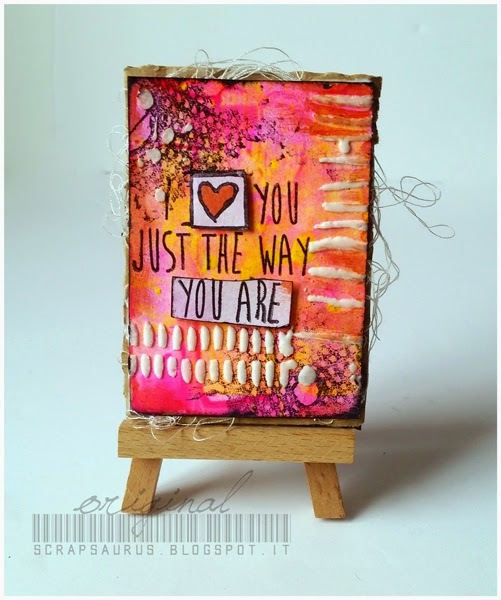 You’ll find more of Pauline’s gorgeous work over on her blog. We will be back soon with a stunning canvas from Doreen! 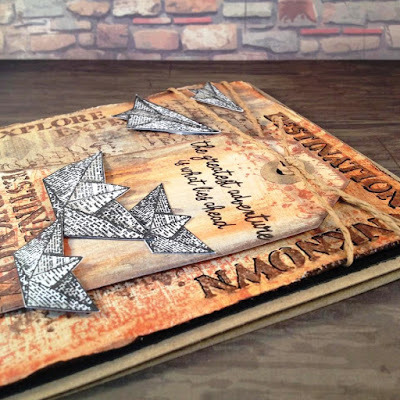 A brilliant project from Susanne! Some gorgeous cards from Karen! And something dark from Kim J!!! Hello 🙂 We are back with more gorgeous inspiration for you! 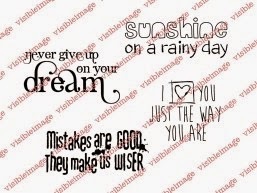 I want to show you my first projects for Visible Image with their amazing stamps! 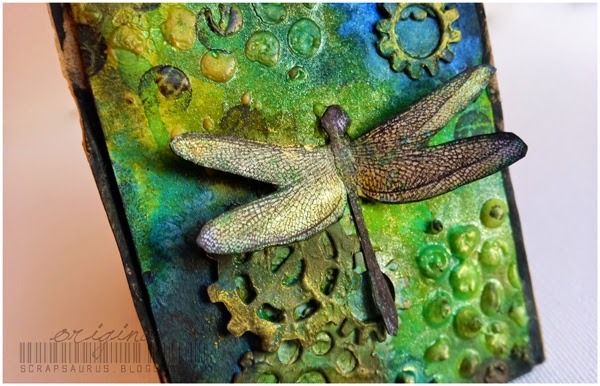 I very much love dragonflies therefore made at once two cards with them! I made a bright card, for summer. 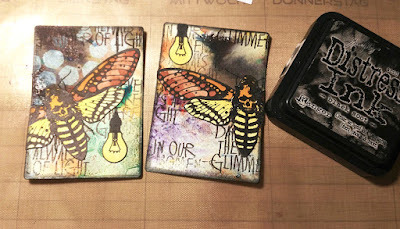 I love such a palette, and these tremendous stamps are perfect for it! And one more card with these wonderful stamps! 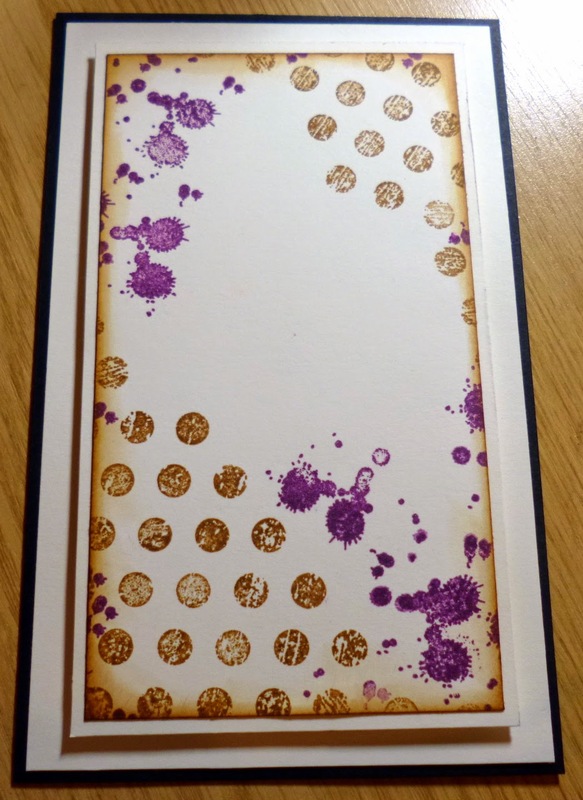 The card made in the same palette. Look how beautiful these tremendous stamps look on my cards! 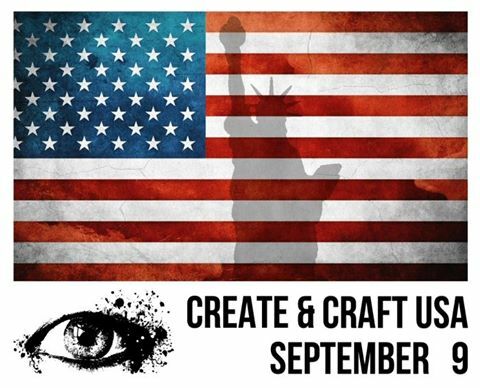 You can check into our Facebook Group for news and chat and to share your Visible Image creations! I hope that you like my projects! 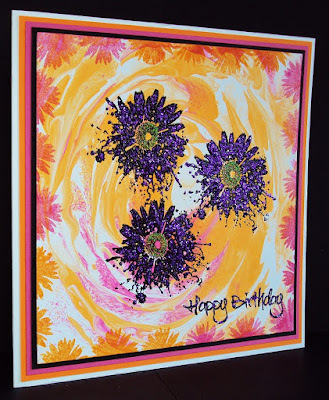 Such gorgeous cards from Elena… fabulous style! 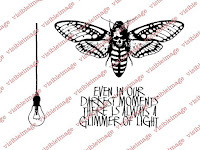 You can find more of Elena’s amazing work over on her blog. Have yourselves a great Friday! Good Evening 🙂 Thanks for coming to visit us. You can’t guess what I’ve done! Oh, maybe you can, the pictures will tell… lol. I’ve digged through my boxes for some rainbow ink pads, and I found a bunch of them. To my surprice they worked just perfect and I had to play some. I’ve used the leaf from Colours of the Wind from Visible Image. The rainbow pads are small so I used three of them, one green, one blue and one red/yellow one. 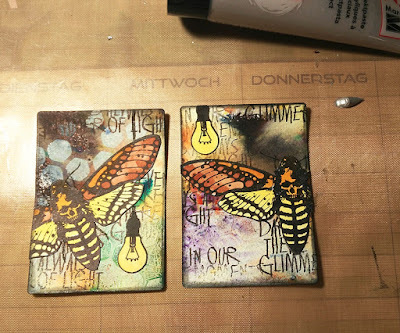 Dabbed them direct to the stamp and made sure they didn’t overlap too much so they would misscolor from each other. 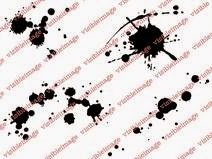 Then I used a fine spray mist and misted water over the stamp to blend the colors a bit. Stamped the image on watercolor paper. I hold the stamp down for a few sec before I lift it up to let the paper absorbe some color. As I could see there was color left on the stamp, and wanted to see how much, I misted the stamp once again with water and stamped again. It become a lighter impression, fully usable. 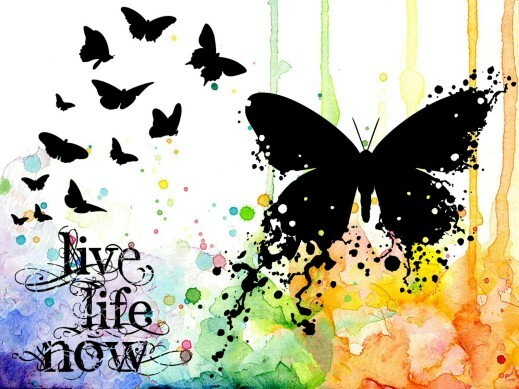 Then I stamped the words in black on top.. Imperfection is beauty and All my Tomorrows. 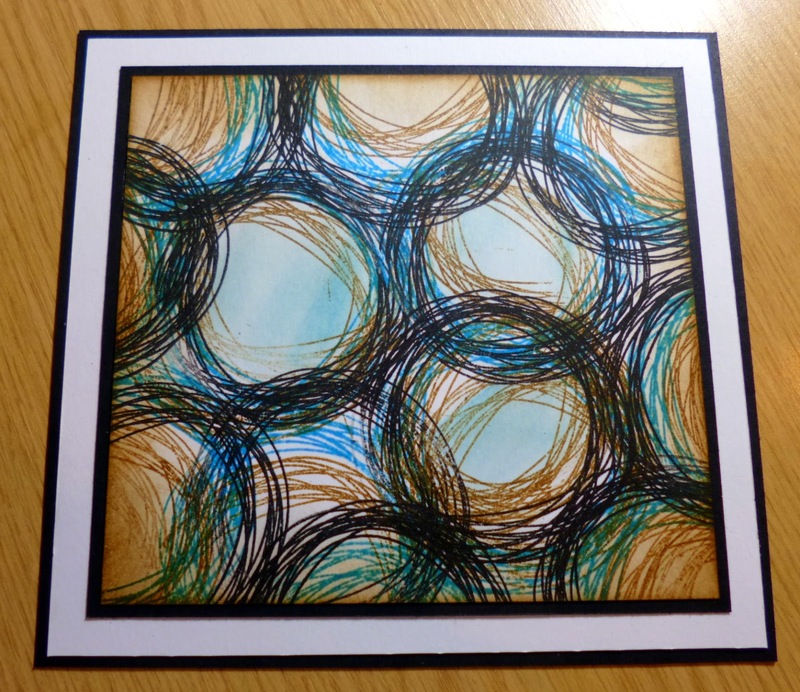 And a card made from the second stamped image without inking up the stamp again. 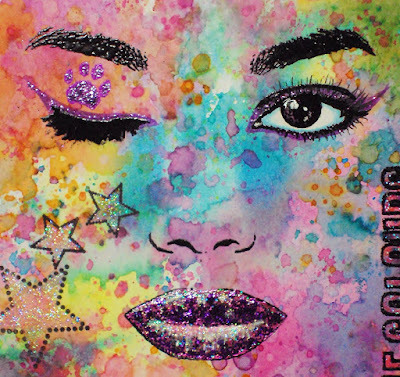 Medium: Blending Blox – rainbow ink pad from Marvy Uchida. Two stunning cards! What beautiful effects you get with this technique… gorgeous <3 You’ll find more of Lisa’s fabulous work over on her blog. 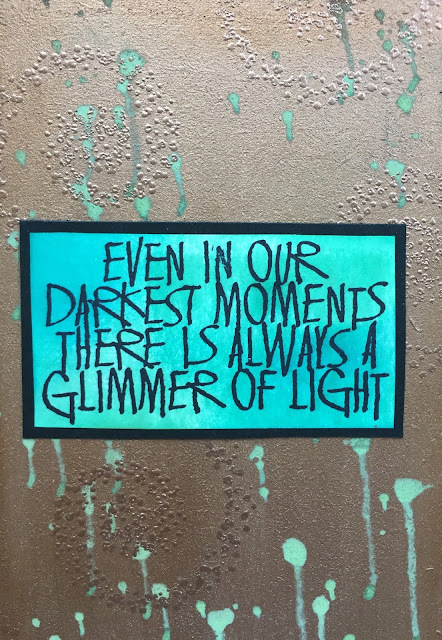 Yesterday was so busy I didn’t get a chance to share Teresa’s Terrific Thursday inspiration with you, so sorry about that! 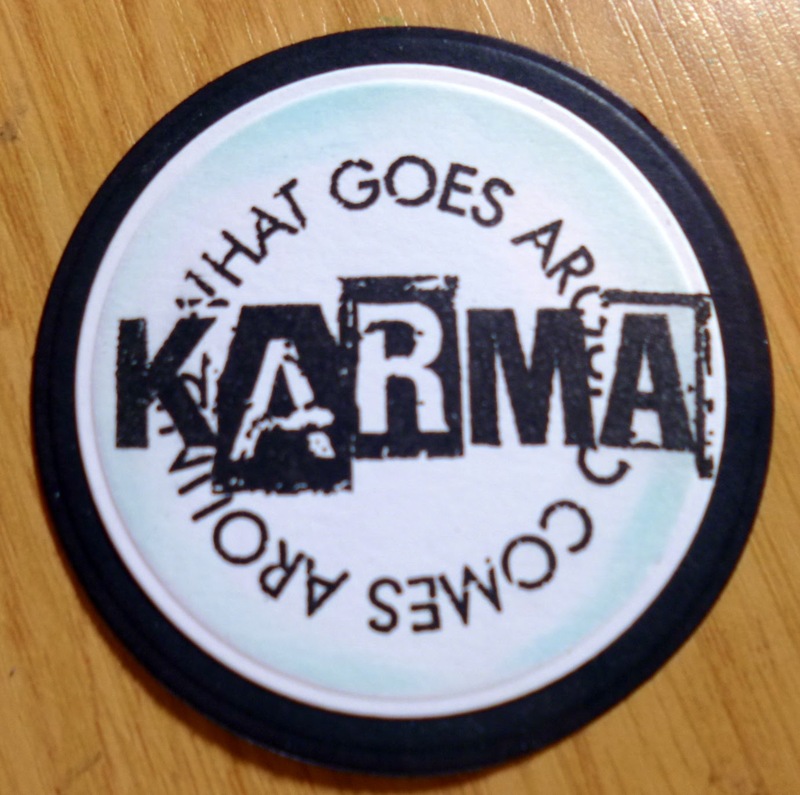 So today we will have 2 amazing posts for you! 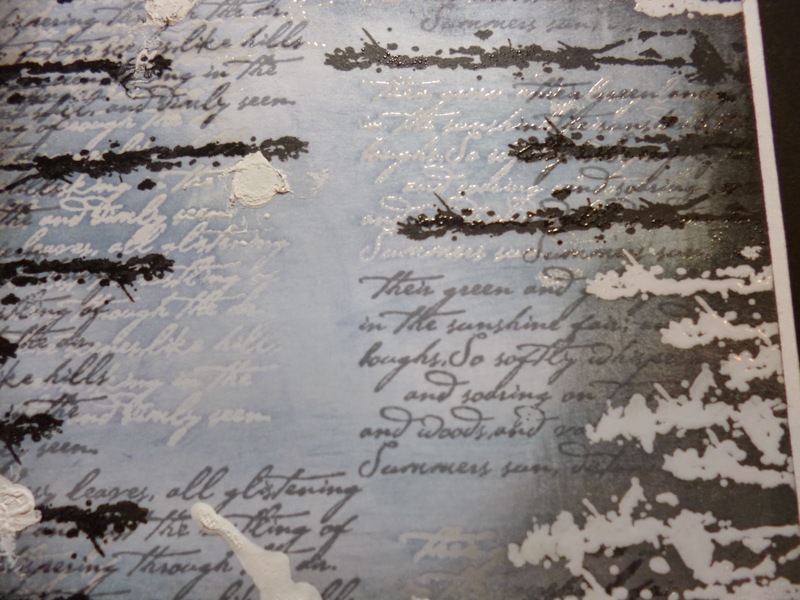 It’s time for another dose of thrilling Thursday inspiration from me for the Visible Image team, and I’ve been mixing my media once again to create a richly textured canvas. I used some Coarse Texture modelling paste through a spider web mask to create the background texture on a blank canvas. (I left the area where the chipboard ‘shrine’ was going to be blank, so that I would be able to glue it into place more easily). I love the little grains in this, it allows you to create extra depth as it is quite stiff, and makes a change from the smooth finish that ordinary modelling/texture pastes produce. Once that was dry I glued the ‘shrine’ in place and coated it all with black gesso, making sure to get into all the little cracks and crevices. 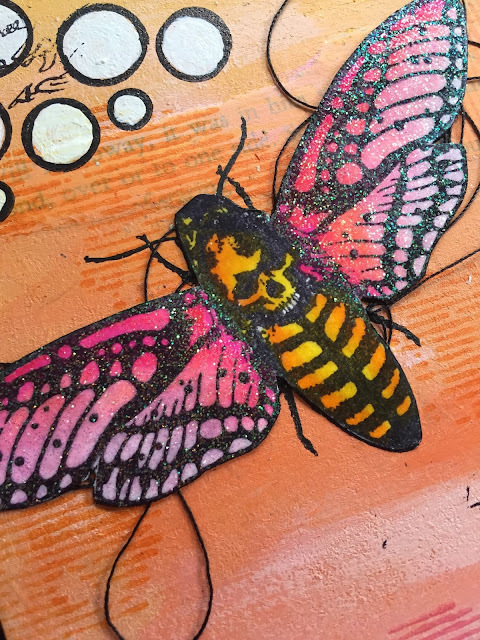 Thankfully gesso dries quite quickly so I was soon able to get to work with my Inca Gold gilding waxes – I used green, blue and purple colours, applying them with my fingers. They really pick up the detail on the texture paste. I used gold gilding wax on the shrine area. I used Glossy Accents to attach some little glass ‘bubbles’ randomly on the web design, just to catch the light and add some extra shine. Then I got to work with my stamps. I randomly stamped the cogs onto the shrine and added gold embossing powder. Then stamped and embossed the sentiment across the bottom. I stamped and embossed the clock and wings onto black card, embossed then carefully cut them out before mounting on 3d foam. If you haven’t joined our Facebook community yet, then now is the time – we are having a 3000 members celebration very soon, so check out the links below!!! Hope you are having a good week , I cannot believe how fast weeks pass by. 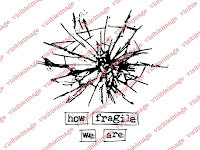 A while ago we were challenged by Visible Image to create something with a stamp thought of as a backing stamp. 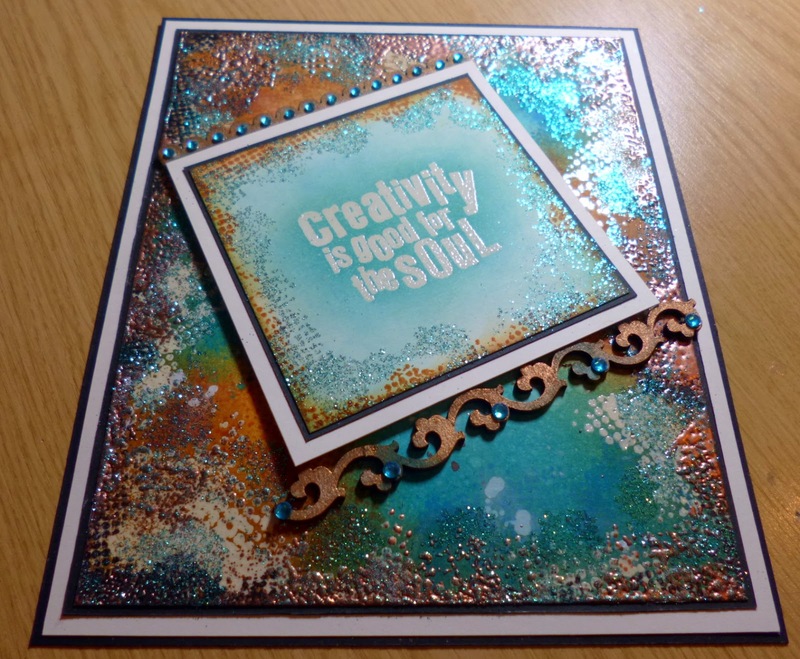 I was sent the stamp set called Edgy and I used one of the Verses from the Make Me Smile set to create this shimmery card below. It has lots and lots of texture and glitter too. A little different hey, I kinda think it has that Girly Grunge vibe to it hence why I think the Edgy stamps were perfect for this one. 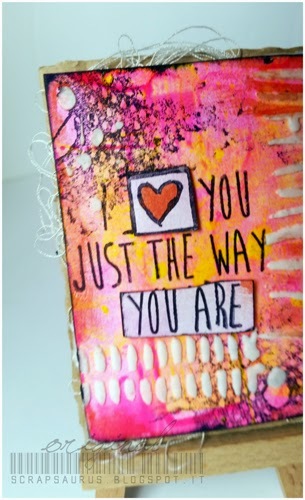 You can see the backing as created in layers of inks and embossing then glitter before adding its central section. 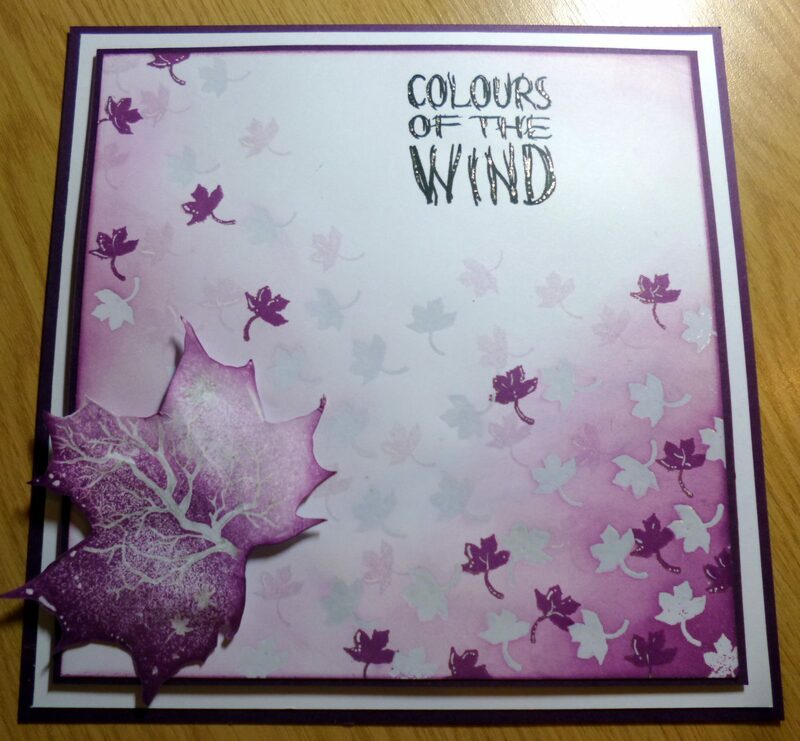 Here is a couple of shots showing the background and how I coloured it with the inks and then some copper embossing and some turquoise embossing, I flicked paint in Sepia colours and white ink also to add to the images but the Edgy stamps give that random but uniform dotty pattern that looks so great stamped in so many different ways here from ink to water bleaching on ink to paints and embossing. Once this was complete I added some black and white mat and layers to finish it off nicely and set aside to start on the centre piece. For the central section I stamped out the Perfect sentiment in Versamark ink with clear embossing and used my Tumbled glass Distress ink to filter the blue from the writing out onto the white card , Usually when we cut a die cut or something like that we bring in the colour from the edge inwards so the darkest is at the very edge then gets lighter toward the centre well If I did that I would or could have used a different colour embossing like the copper or a Gold to match but sometimes that isn’t as punchy as white and I knew I didn’t want to use a plain one colour piece of card so I worked very lightly and brought in the ink from behind the writing and filtered it outwards and then added more layers until it had the saturation I was looking for behind the white. 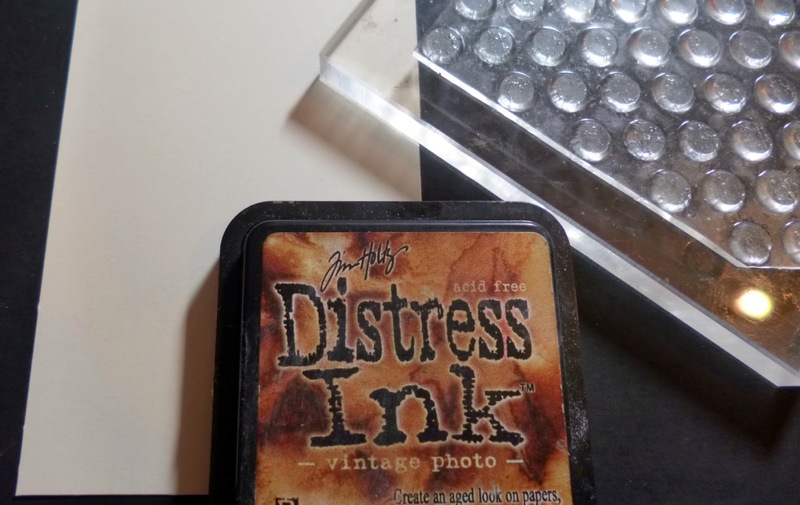 I then added some more edgy stamping in Rusty Hinge Distress ink around the edge and filter in a little Vintage Photo ink and heat set all. 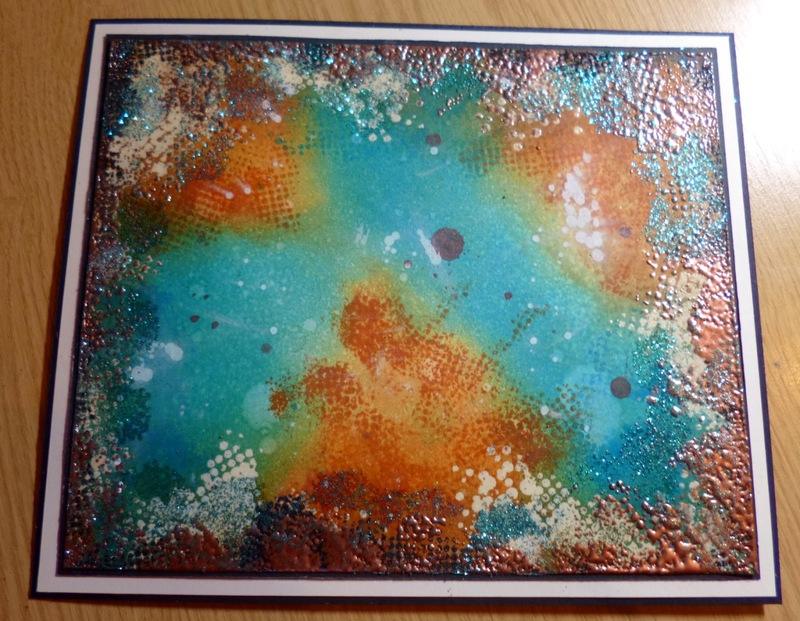 I then added some more versamark ink and some WOW embossing powder in clear with turquoise glitter to give it its sparkle. again more mats and this centre was complete. I added some small card pieces I inked and embossed to the top and bottom of this too before mounting onto the background finished earlier. 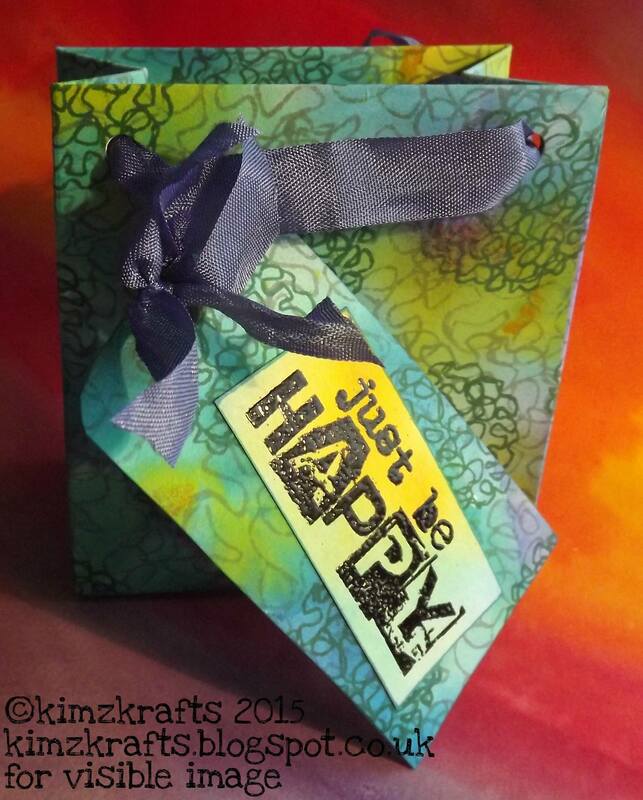 So the stamp sets I used to create my little Glitteratti Girly Grunge affair was…..
Make me smile set. Edgy Set. Have a Wonderful Wednesday my friends. It REALLY is incredible sparkly and shimmery, and the texture is superb! 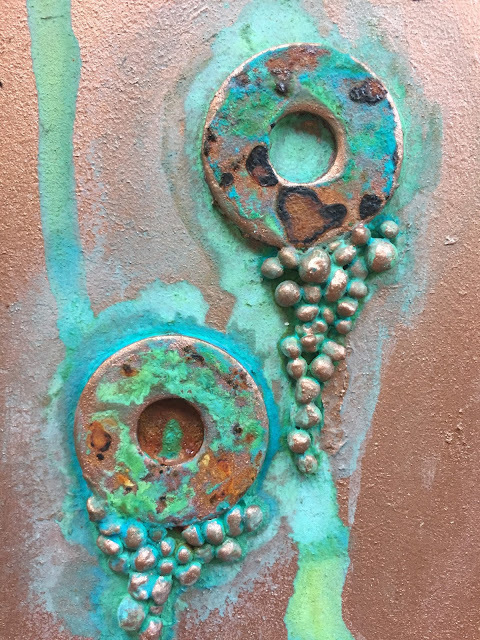 Love the turquoise against the coppery tones. Awesome work Kim! 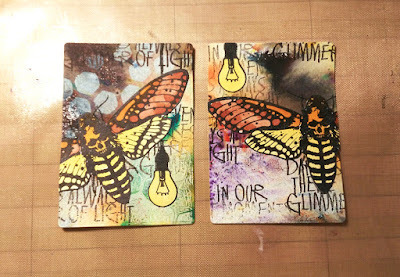 You’ll find more of Kim’s inspiring projects and step by steps over on her blog. See you tomorrow for some musical inspiration from Teresa Morgan! Hi there! Welcome to our blog 🙂 Today we have more NEW stamps inspiration for you. 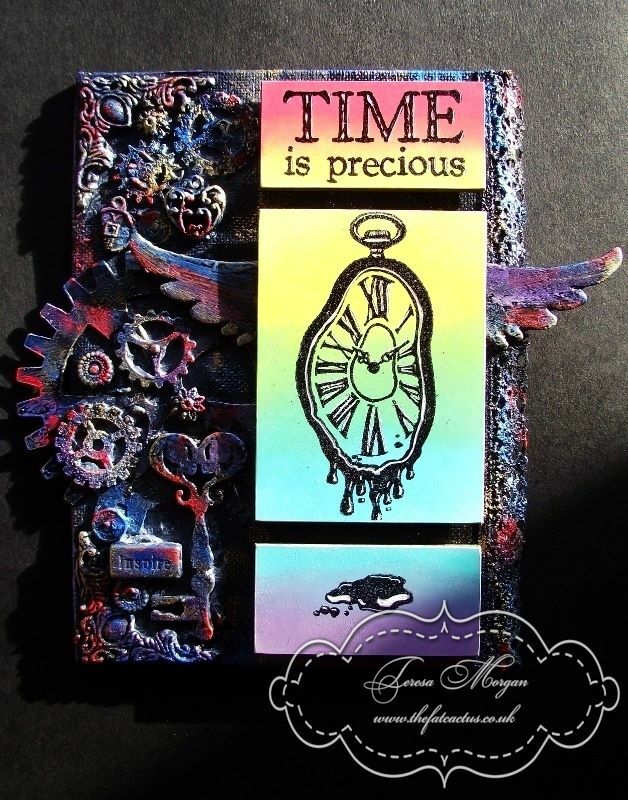 It’s my turn to inspire all you Visible Image fans out there, and today I am using one of the fabulous new INKognito 2 stamps – Time Is Precious. 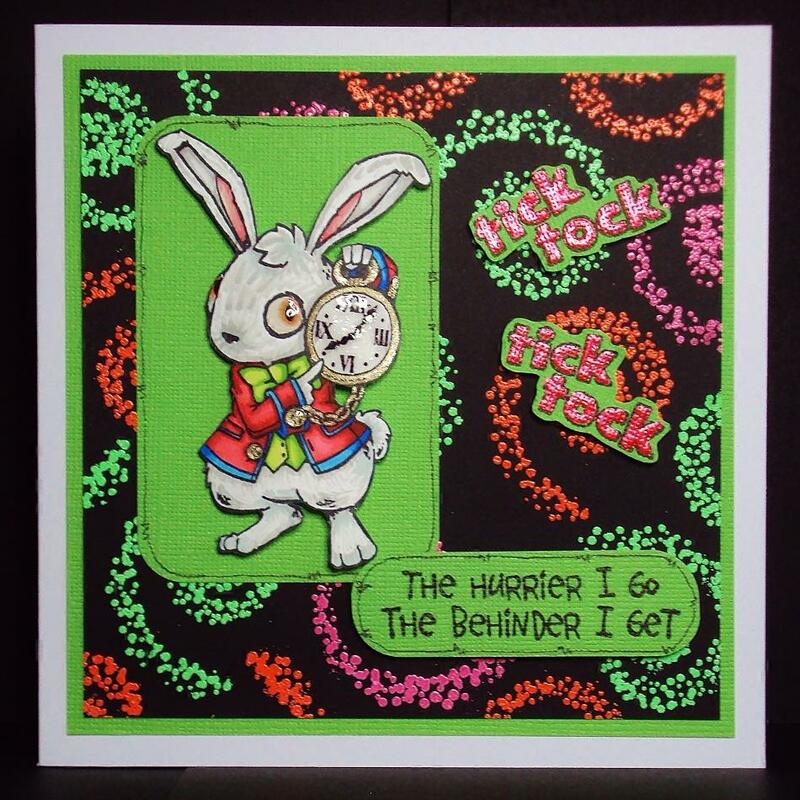 I coloured some Stampbord with Distress Inks them stamped the clock and words with black Staz-On ink. 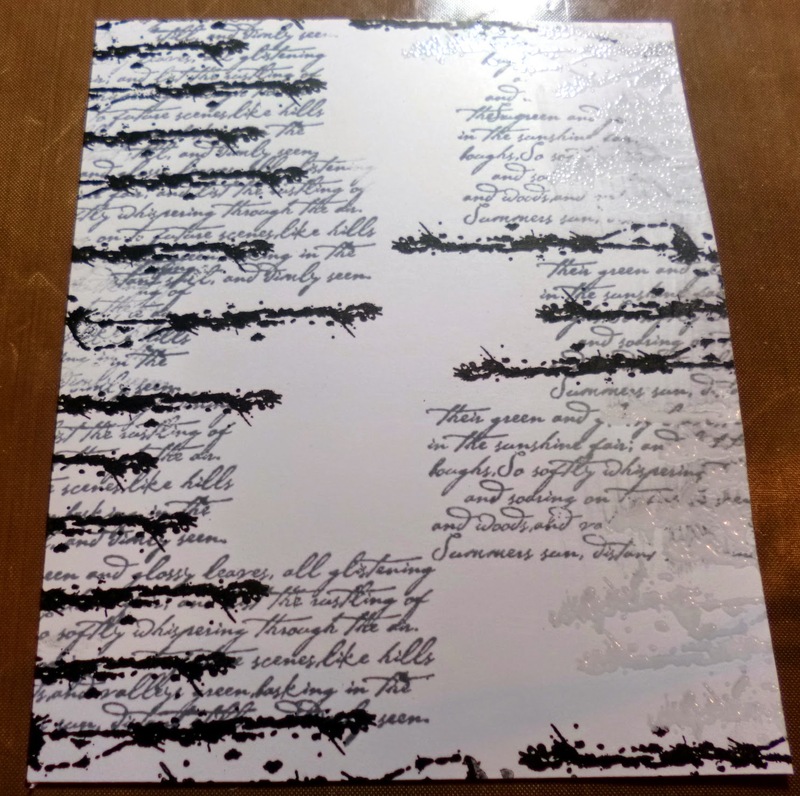 Using a scraper tool, I added the white highlights (my favourite part of using Stampbord). I took a 7×5 inch canvas board and arranged a selection of textured objects (metal charms, buttons, wooden shapes, lace, etc) on it, leaving space for my Stampbord to be added later. I glued everything in place with Pinflair glue gel and let it dry. Then I covered everything with a generous coating of black acrylic paint. 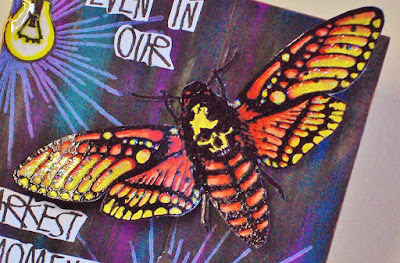 Once that was dry I took some Viva gilding wax in red, blue, purple and gold, and added highlights to the piece. 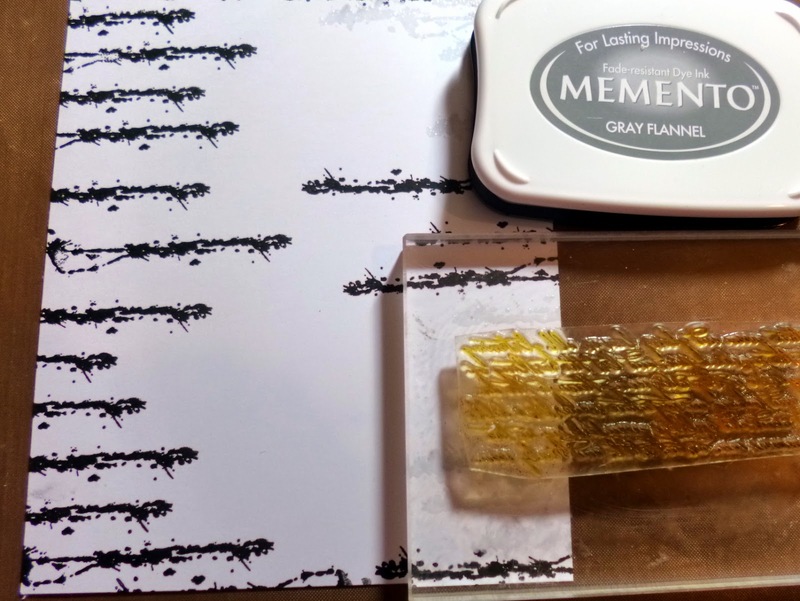 Then finally I glued the Stampbord in place and allowed it to dry. 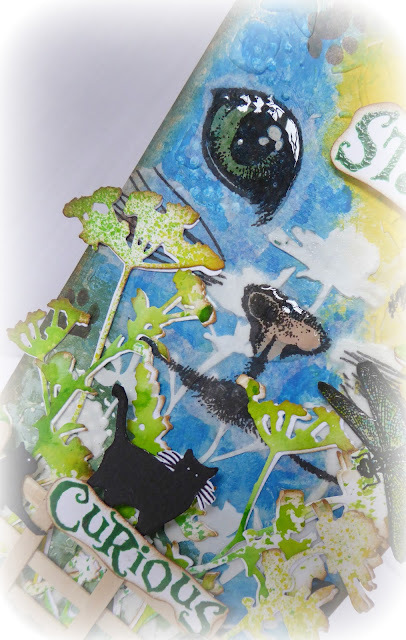 I hope that you are inspired to try something different with your stamps, they are not just for cardmaking, but ideal for all types of creative projects. Thanks for stopping by!! A stunning piece of art Teresa! Love it! Hope you have a great day… it’s almost the weekend 🙂 Come back tomorrow for fabulous Friday with Pauline Butcher. Good Evening… Another late post! It’s a crazy week but we are getting very excited for the CHSI show at the NEC now 🙂 2 more sleeps before we head off to Birmingham! 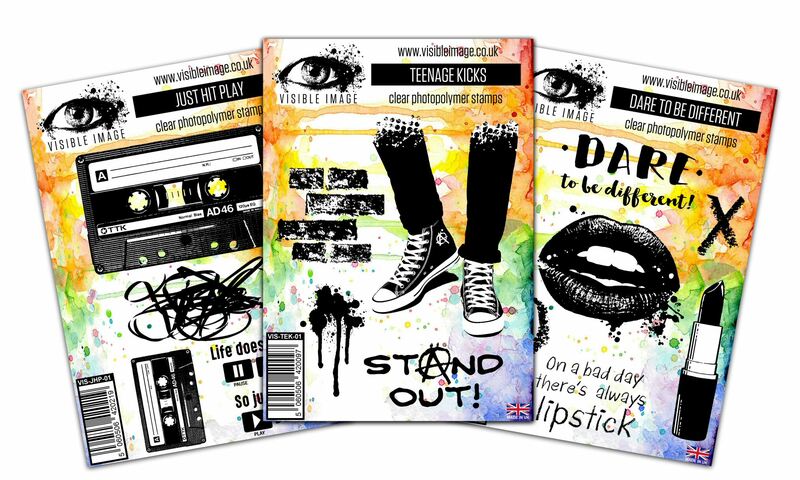 It’s been a busy few weeks for the Visible Image team as they have just launched an amazing collection of new stamps. Today I’m sharing one of the new Inkognito II range. 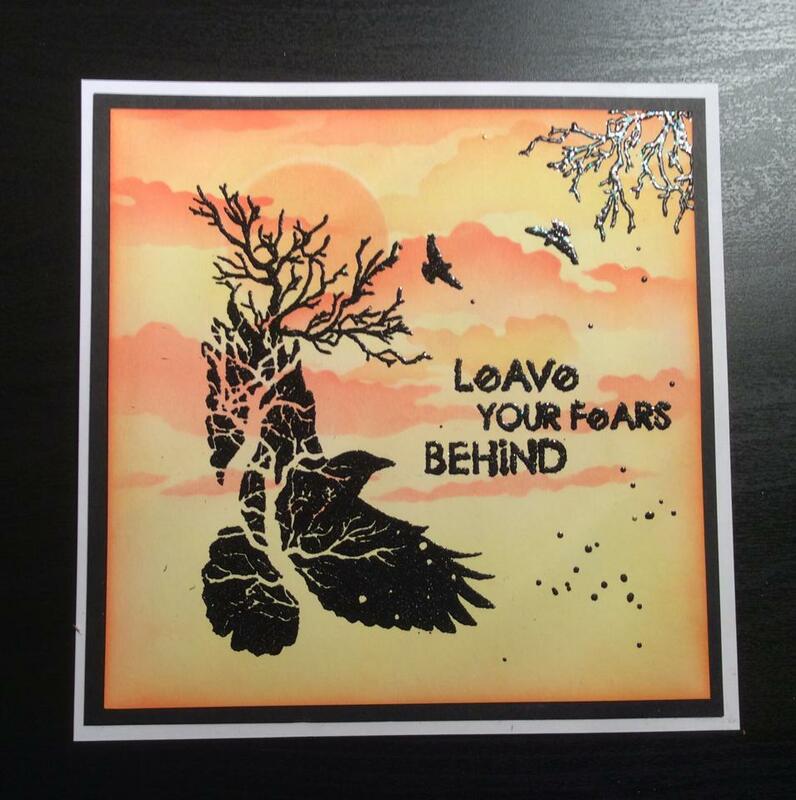 This one is called ‘Leave Your Fears’ and is so beautifully detailed in it’s design. 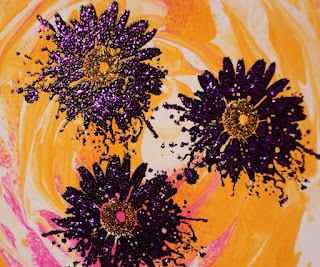 I created the background using shaving foam and Dylusions spray ink – great fun, if you haven’t tried it!! 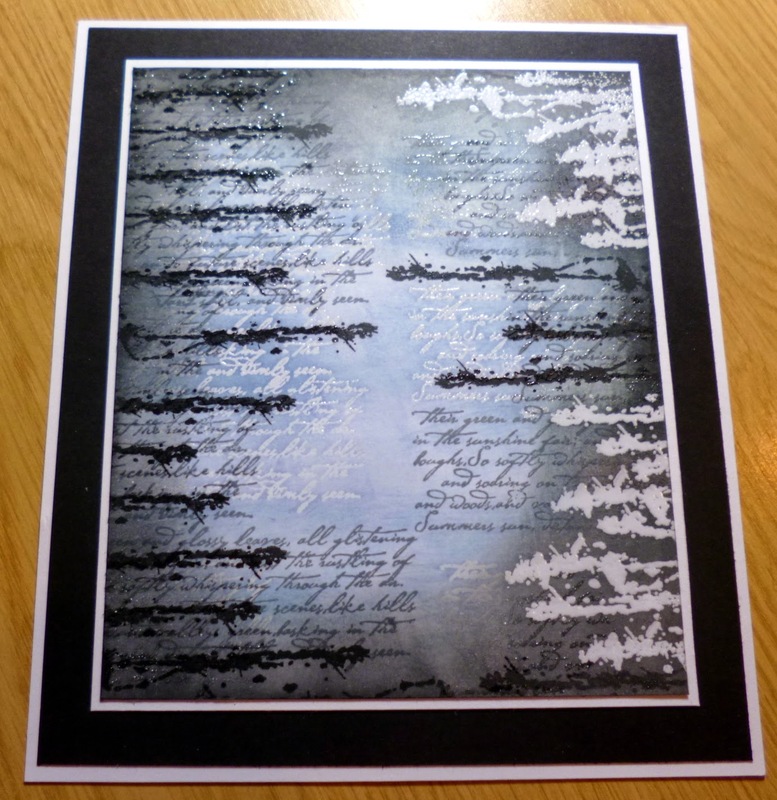 I then stamped the image and words with Versamark ink and used black embossing powder. If you would like the chance to win this, or any of the 24 new sets of stamps, then make sure to head over to the Facebook PAGE for details of a great giveaway!!! Amazing card Teresa! 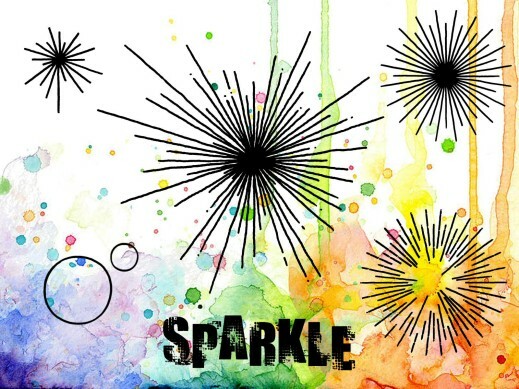 Love the background! 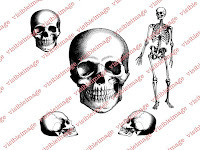 Thank you for visiting us today here on the Visible Image stamps blog. 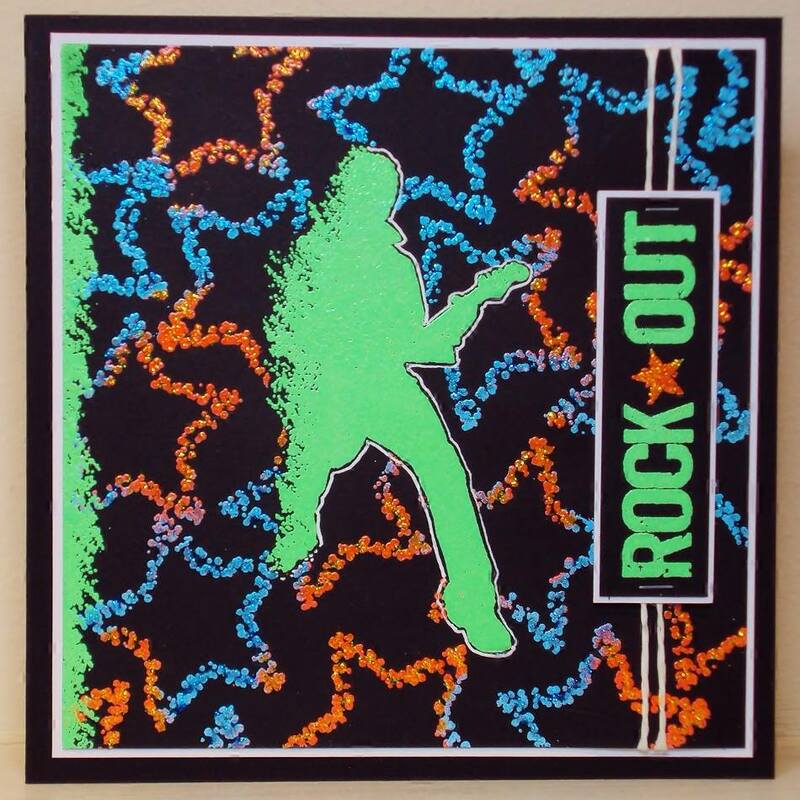 Come back tomorrow as we have some totally rocking inspiration from Pauline Butcher! 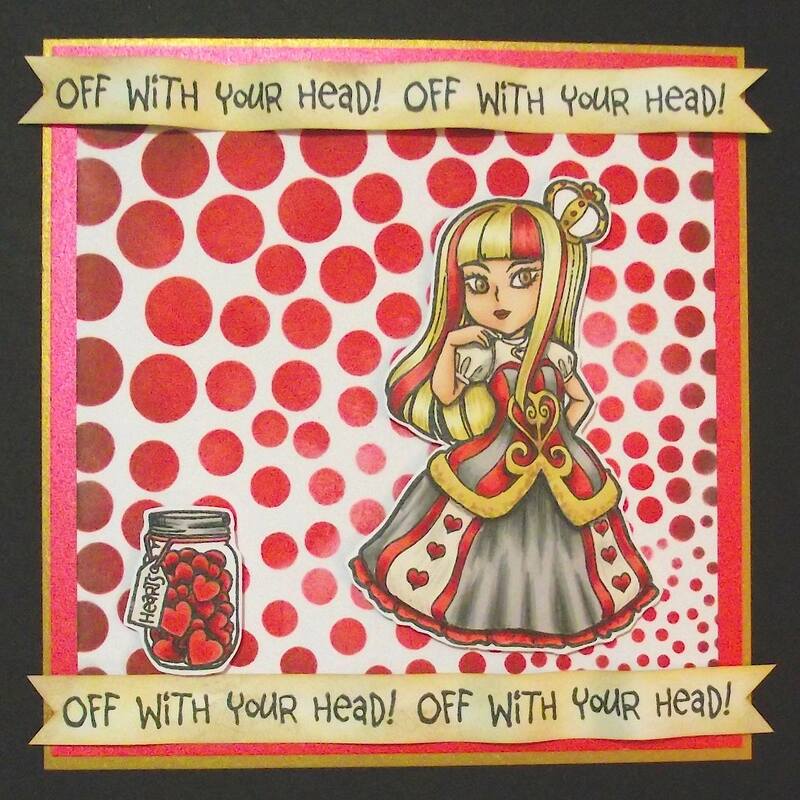 For today’s ATC I was inspired by the super talented artist that you all know for sure: Finnabair . I love her style and the way she creates and after taking part of one of her workshop I wanted to try to use her technique in my works. 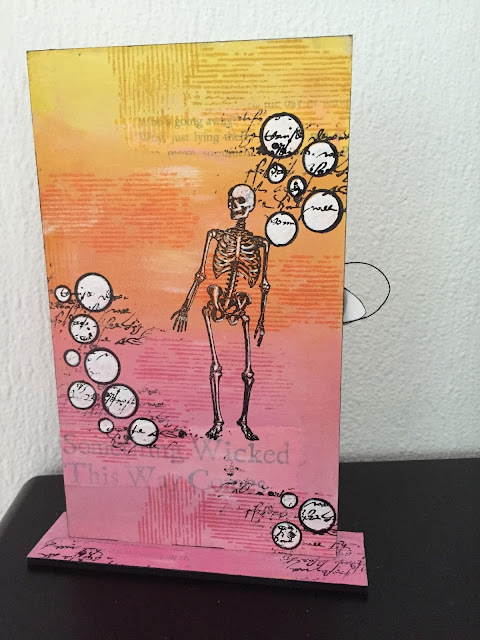 And today I used stamps by Visible Image…. 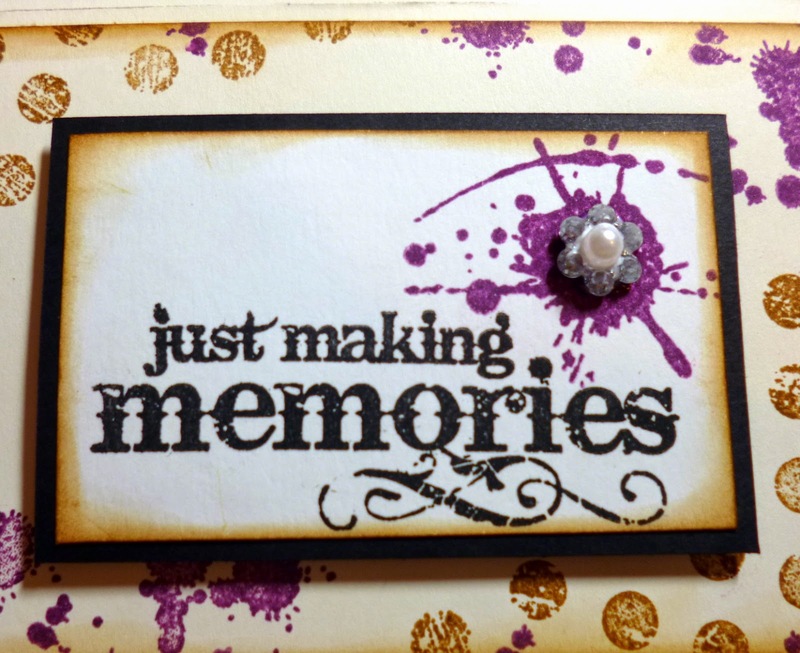 For my base I used Lindy’s Stamp Gang sprays that I love. They are awesome and they perfectly blend with eachothers. 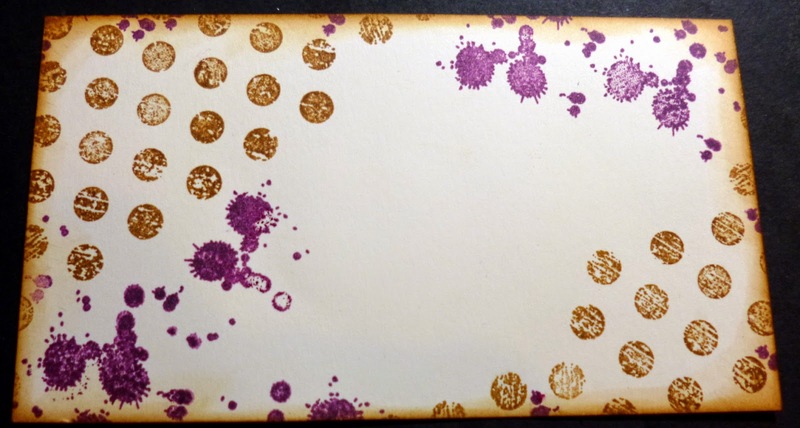 I then stamped part of the background with Grunge Polka Dot and archival ink. As always I didin’t use the acrylic block since I was not looking for a perfect background. 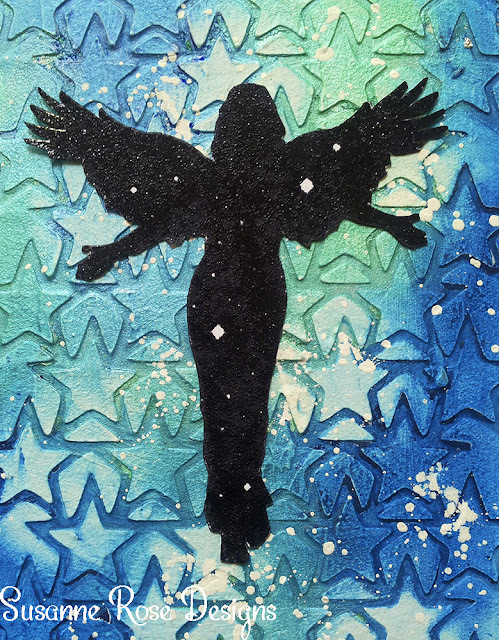 I kept adding dimensions and colors to the background and then I added through a stencil the modeling paste. 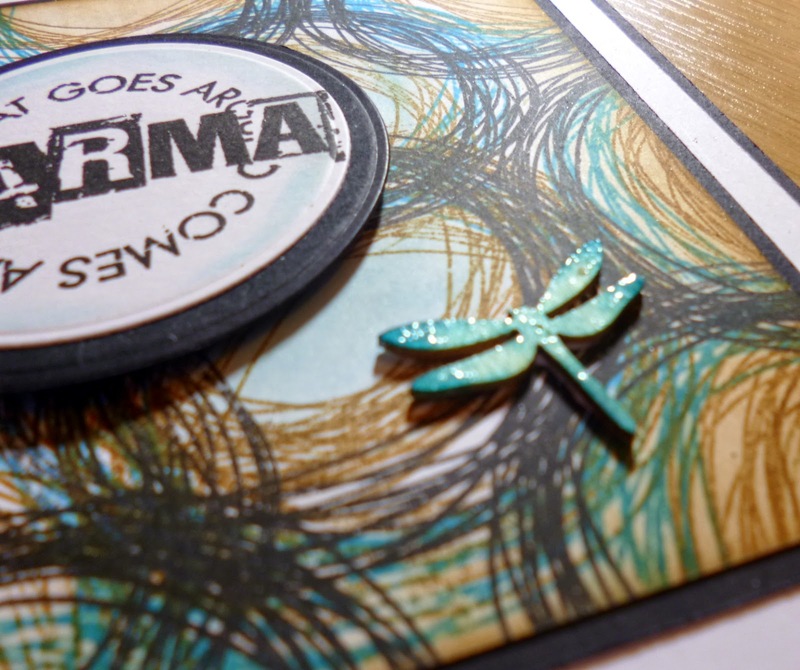 While everything was drying I stamped this wonderful Dragonfly over a white cardstock, also with archival ink. 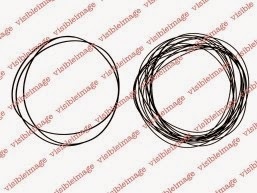 I then colored the stamped image with Primary Elements. And here are the photo of the final project. 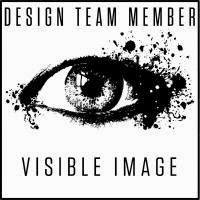 Make sure to visit Visible Image Blog and also the Facebook Group!! 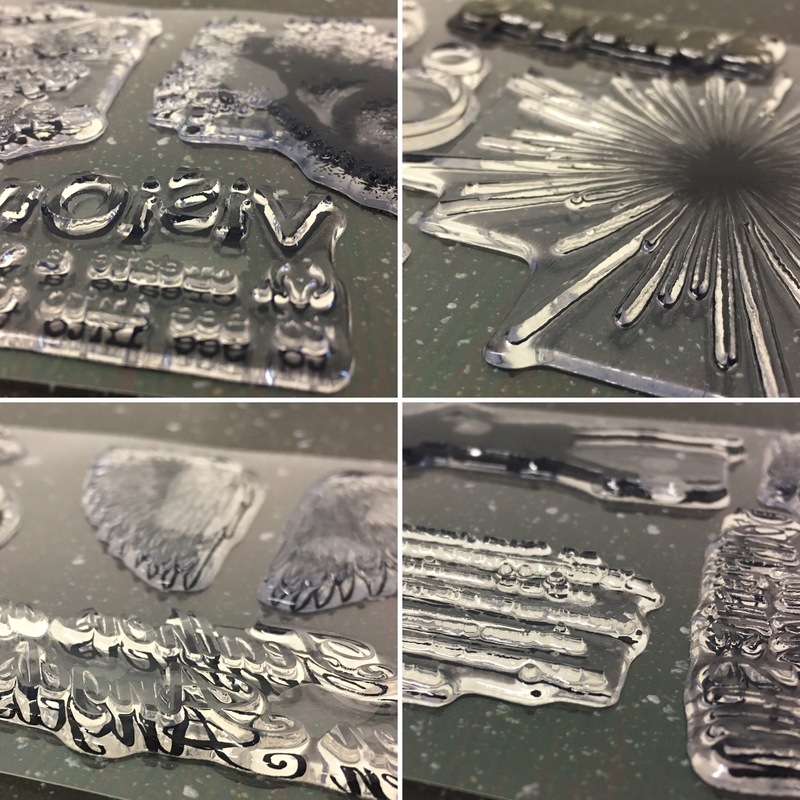 Over in the facebook group we have a new challange called “SHOW & TELL” where we ask you to show with us your creations using Visible Image stamps and also telling us the story behind the creation! 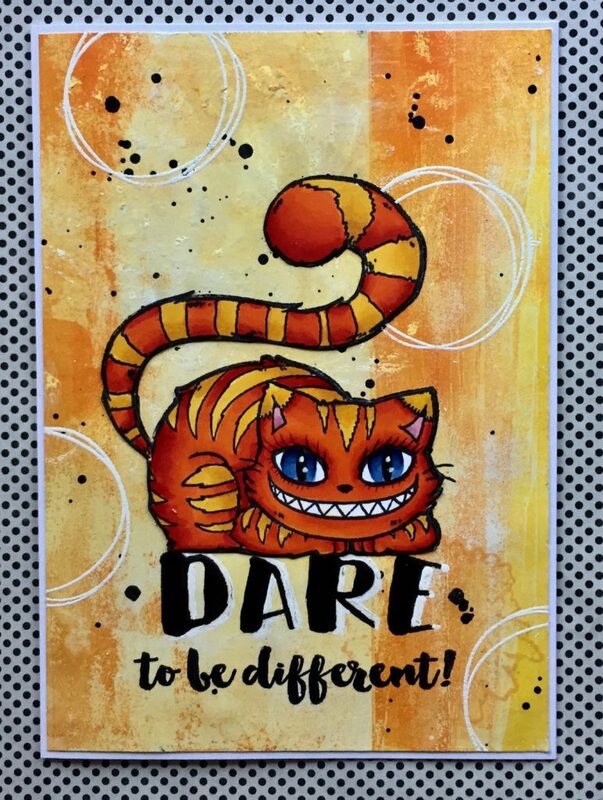 It’s Marvellous Monday, extra marvellous because today we are sharing an awesome project created by Kim Bacon with one of our BRAND NEW stamp sets! Not yet released!!! 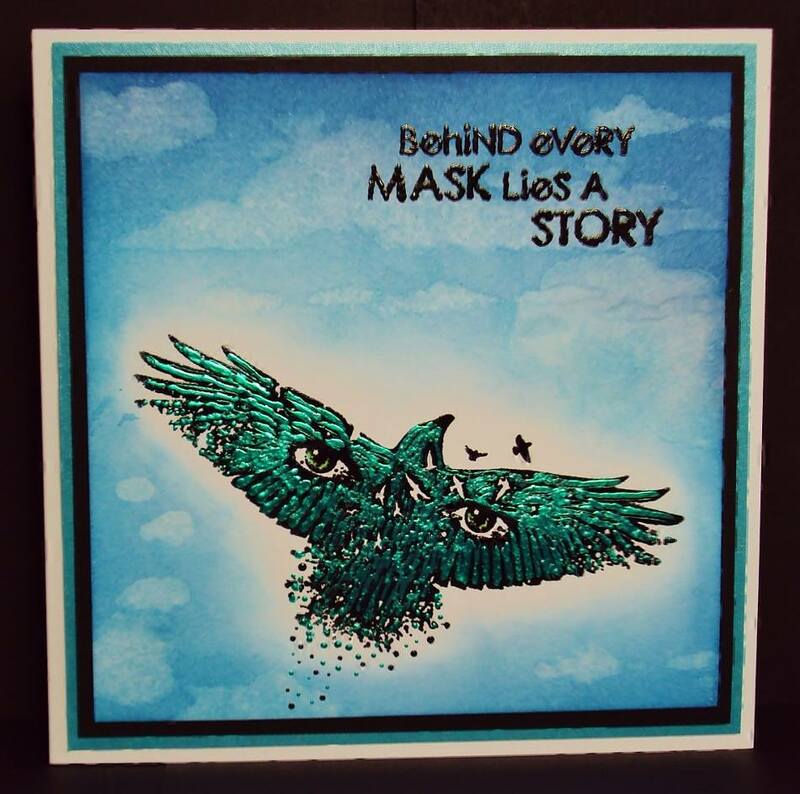 Kim has been working with our ‘Behind Every Mask’ set…. A stunning crow mask with great words! Don’t we all sometimes wear a mask? Put on a brave face and hide our true feelings. 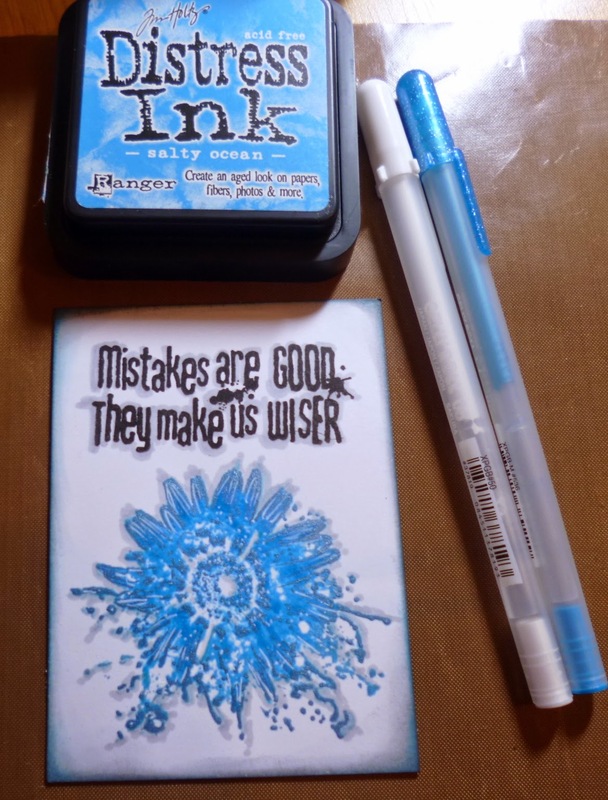 Perfect stamps for journaling and mixed media projects. I am really excited to be able to finally show you what I have been doing recently! The guys at Visible Image have done it YET again with their latest release. Or maybe that should more accurately be releases as there are quite a few stamps in total being launched in the next few weeks and ALL of them are on pre-order from 6th February. If you are a Facebook Group member then you will have seen most of them by now. There’s a hint for you as to why it is essential to join the group, they get all the juicy bits first! What I have got for you today is part of the INKognito II release. Isn’t it an amazing stamp? And what about that sentiment? Perfect isn’t it? I have made a card this time but this ‘family’ of stamps is great for all sorts of different types of project. I think these would be perfect for journaling. 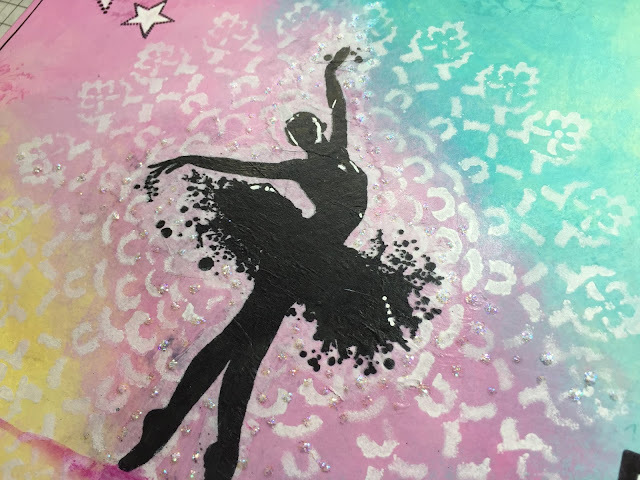 Check out the other DT blogs over the next couple of weeks to see even more of the new stamps and get inspired by the projects they have made. Hope you like this project and that it encourages you to check out what else Visible Image have been up to already this year! 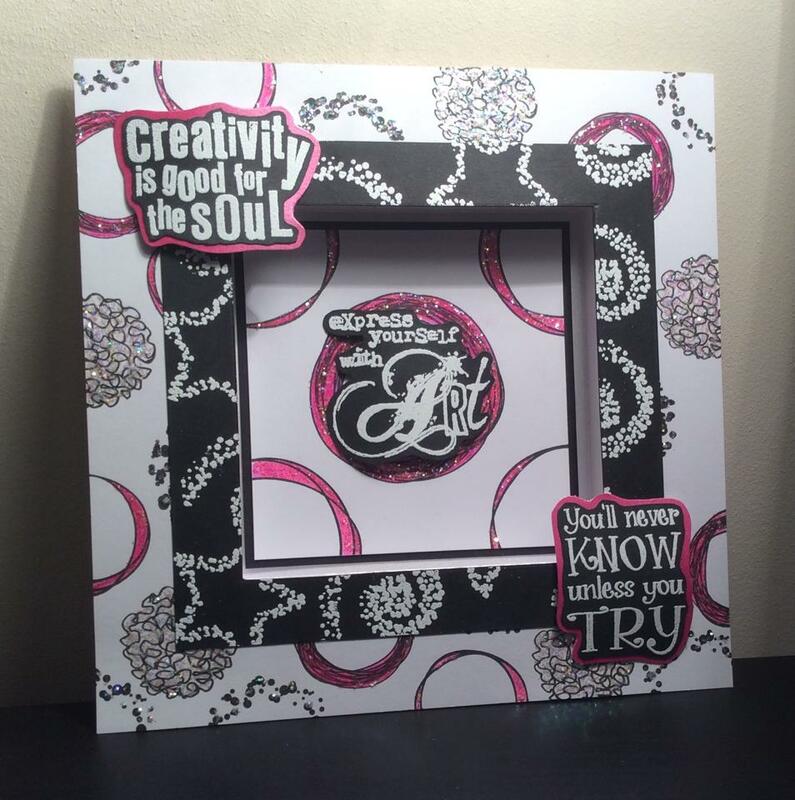 Click HERE to go to see all the latest DT inspiration projects and check out the Gallery. Amazing card! Love Kim’s background with these stamps! 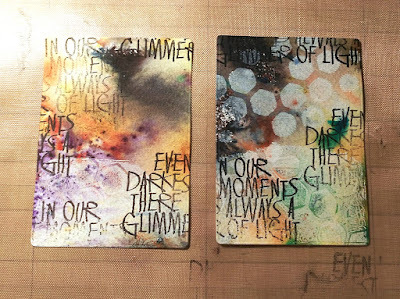 You will find more of Kim’s work over on her blog.